Students learned the three primary colors: red, yellow, and blue. 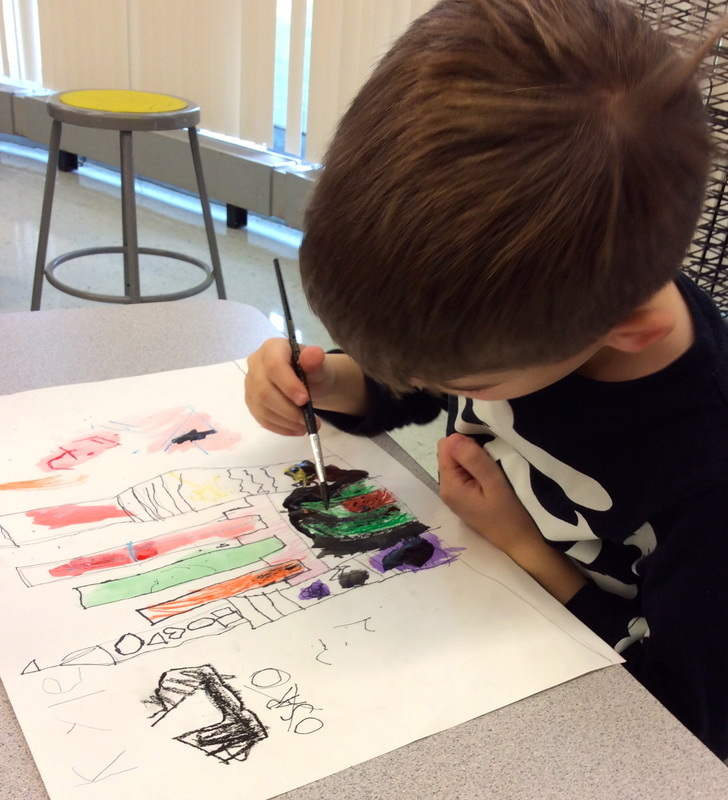 I demonstrated a “magic trick” mixing dyed water to show them that the three primary colors can be mixed together to create the secondary colors. 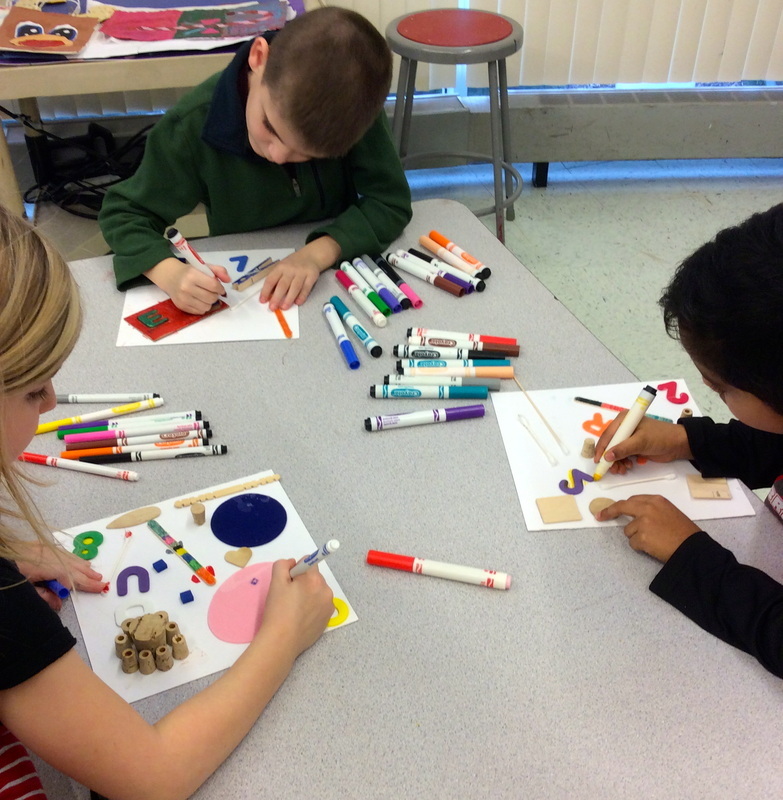 Students used only primary-colored pieces of tissue paper and layered them to create colorful abstract collages. They predicted which new colors would be created as they overlapped the different colors of tissue paper. 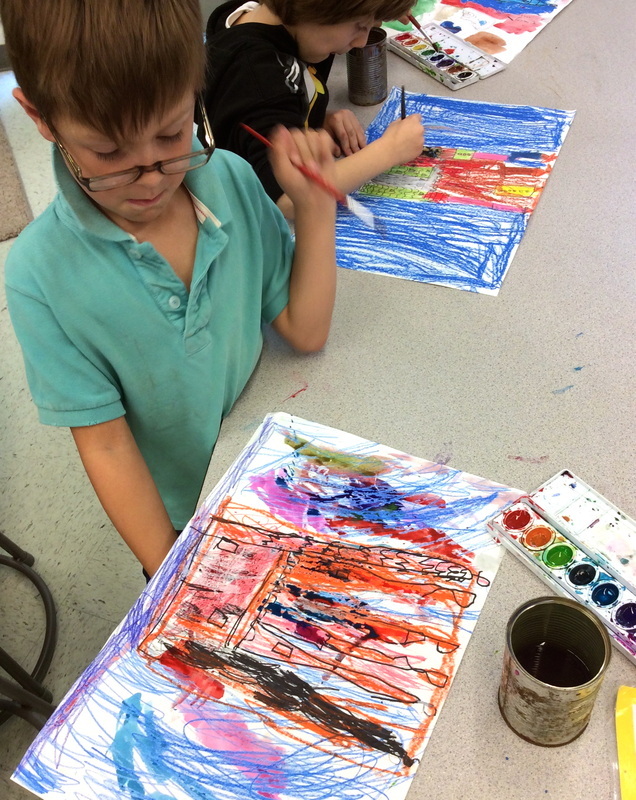 Kindergartners used primary colored tissue paper, a transparency sheet, watered down glue, and a paintbrush to create their faux stained glass masterpieces. Students followed the pattern: glue, tissue paper, glue. 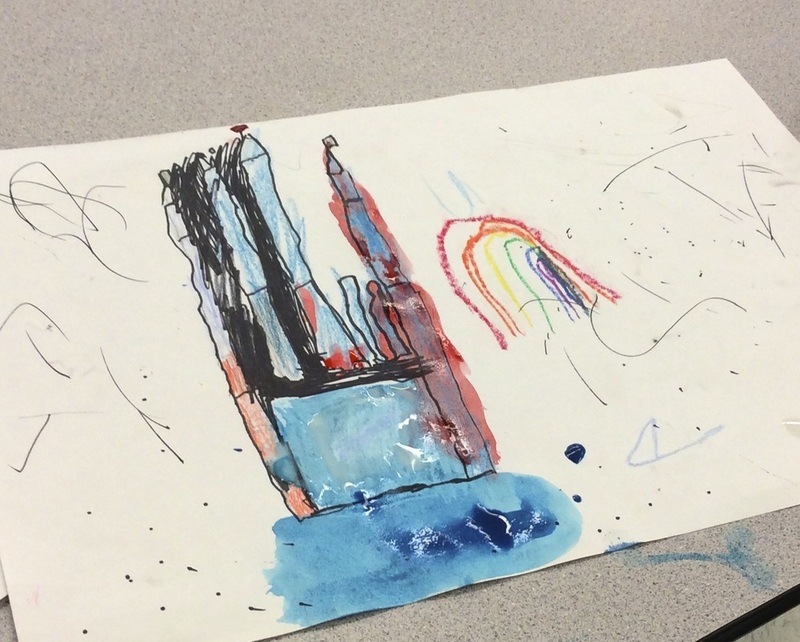 They painted their transparency with glue. 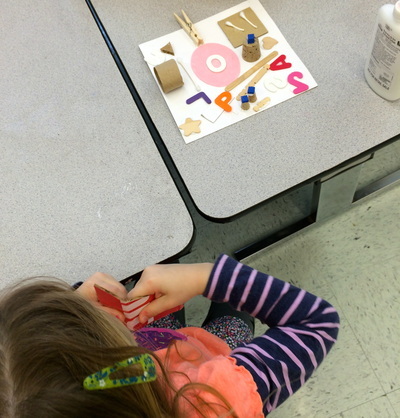 Laid down pieces of tissue paper. 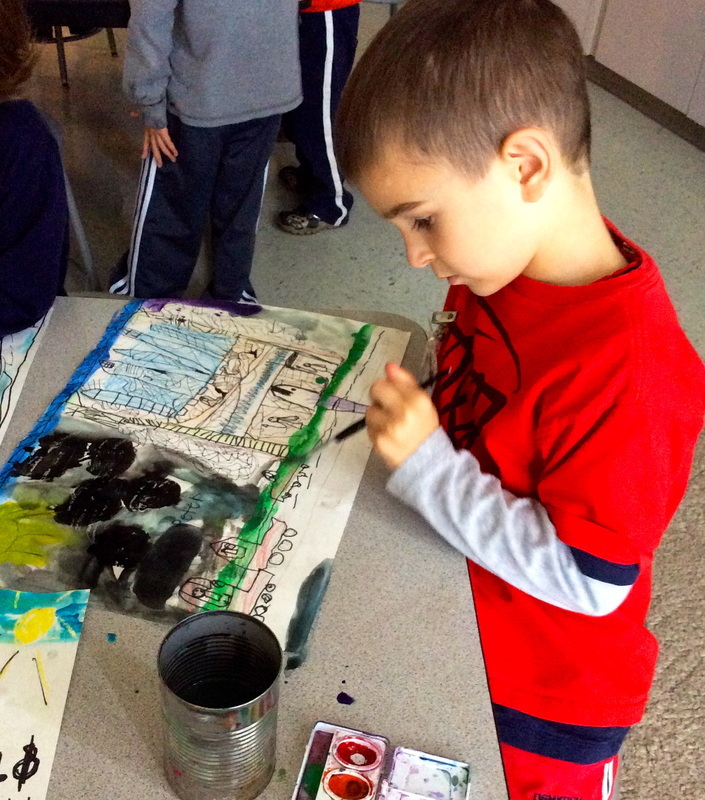 Students then painted more glue on top to fully saturate the tissue paper. 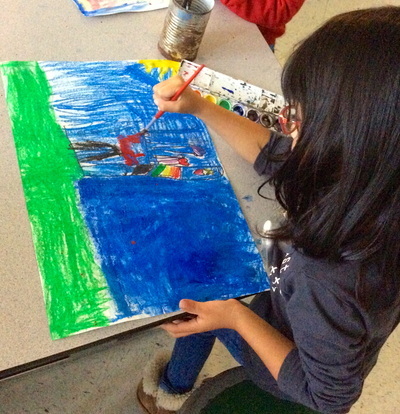 Repeat process to cover surface. 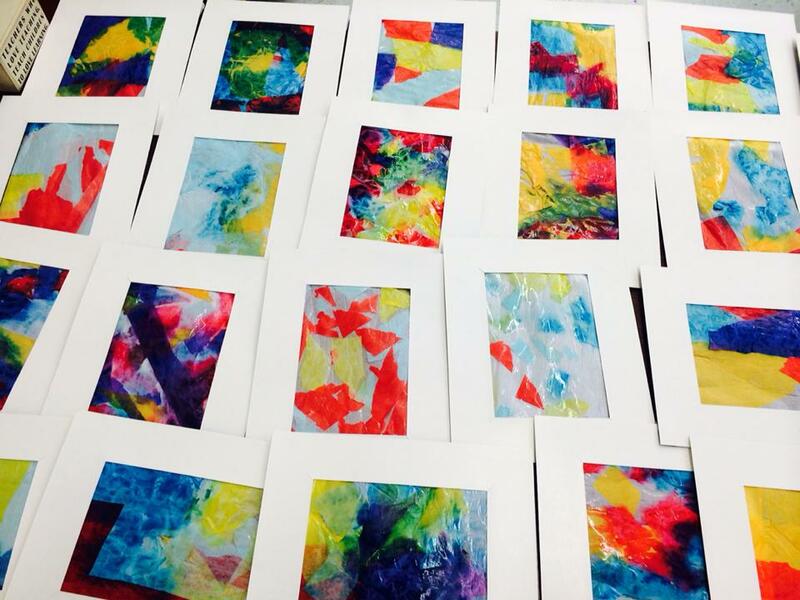 Once dry, I pealed the tissue paper collages off their transparencies and attached them to mat board frames. The kindergartners used their imagination and practiced problem solving skills by cutting and strategically arranging shapes to create a spaceship scene without prompt or suggestion. 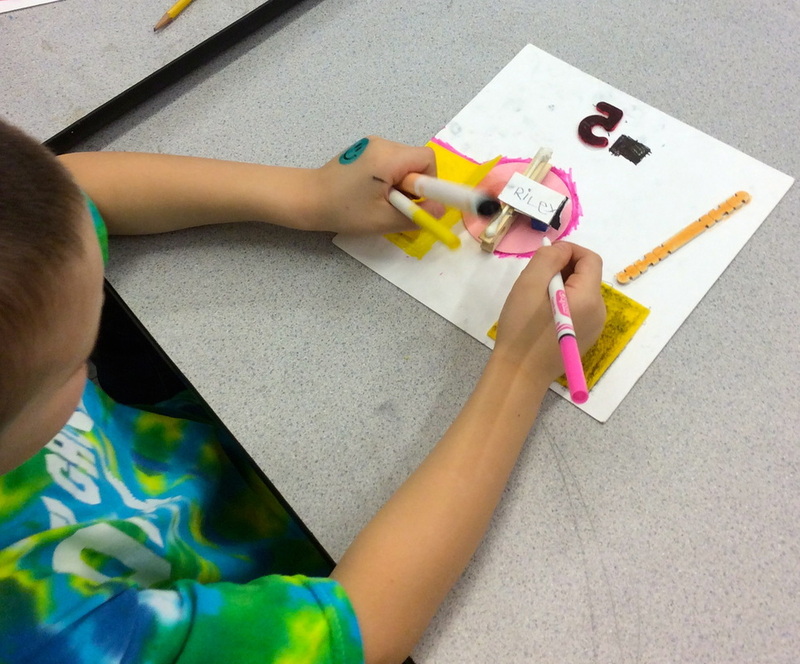 Students were each given two different colors of construction paper scraps, a glue stick, black paper, and a white colored pencil. 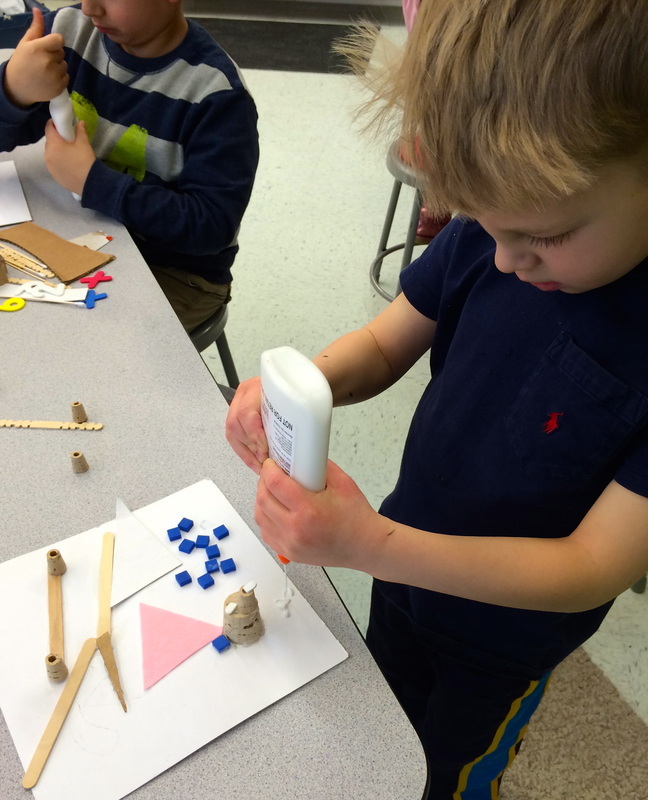 To create a rocket ship, students first cut their paper scraps into various shapes. 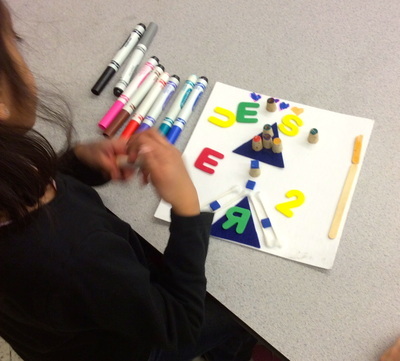 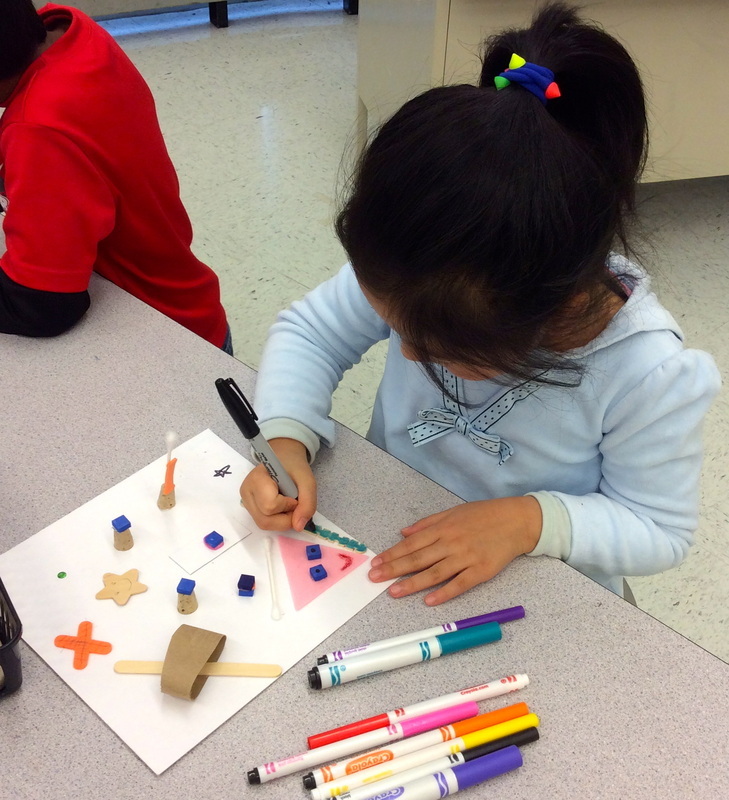 Students then arranged their shapes to form a rocket ship and glued them to the paper. White colored pencil was used to draw details on and around their rocket ships/space scenes. 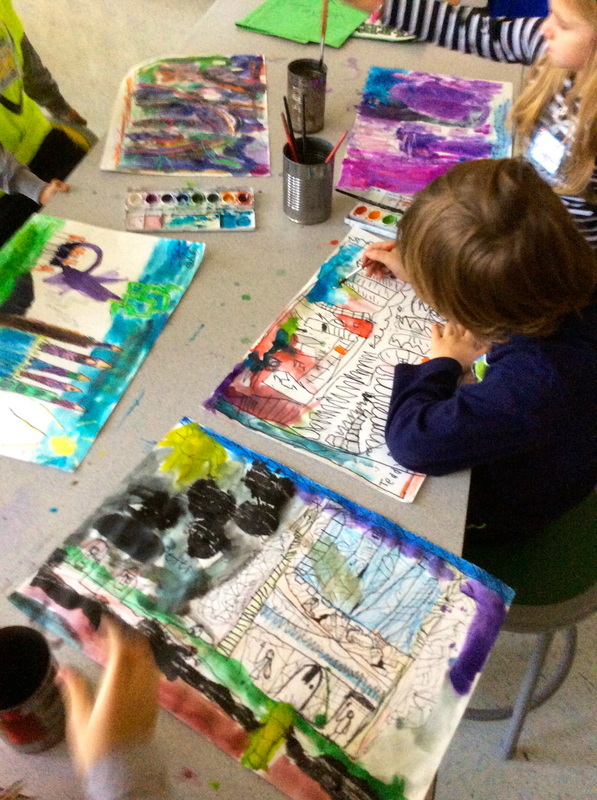 Students used sharpie, oil pastel, Crayola markers, paintbrushes with water. After being introduced to Claude Monet’s Water Lilies (above), students pointed out what they saw in his pond and brainstormed what else can be seen in a pond. 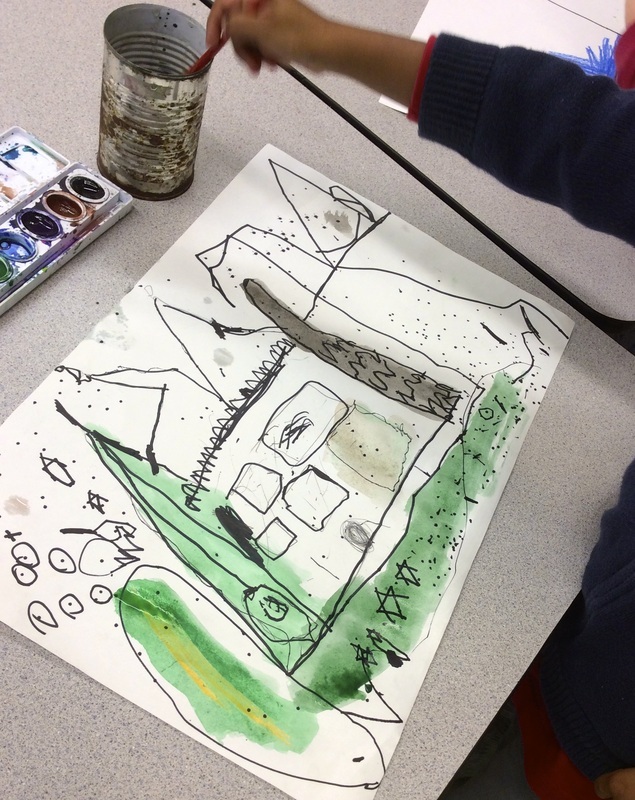 Students then used sharpie to design their own pond, drawing fish, lily pads, crabs, seaweed, etc. 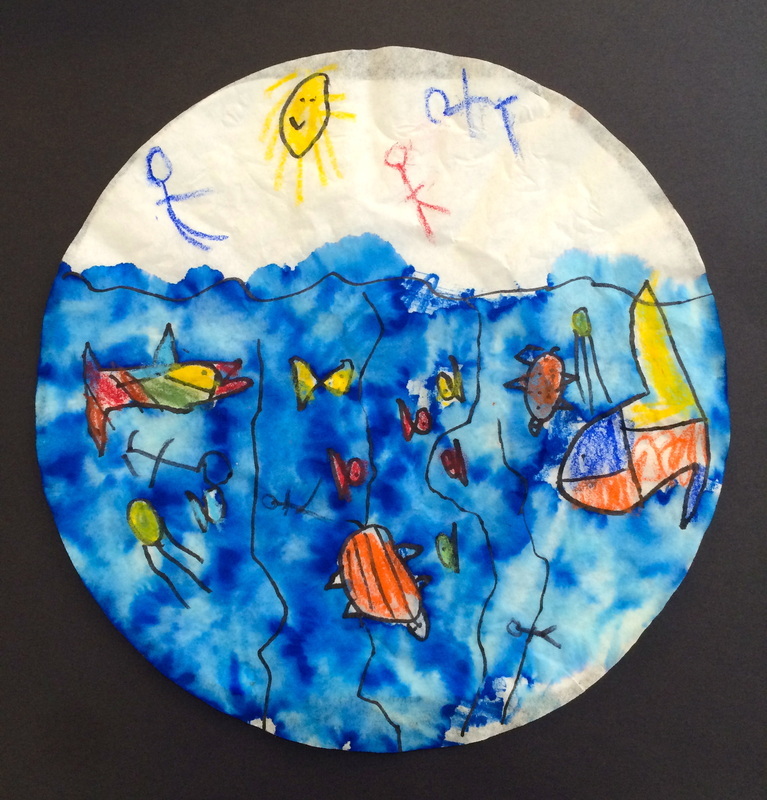 on their coffee filters. 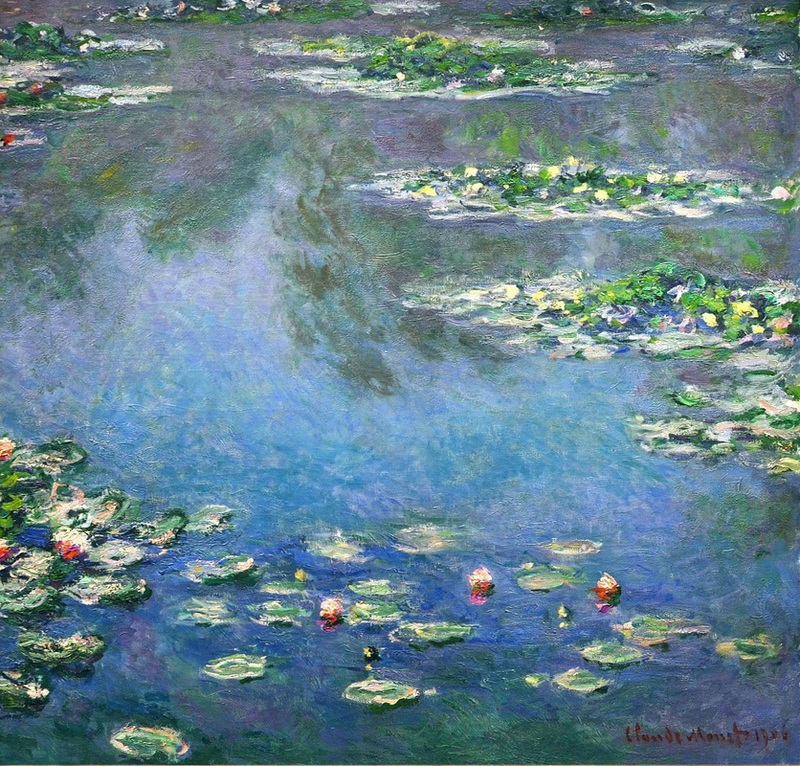 Oil pastel was used to color in their pond objects. Next, students scribbled and filled the rest of the coffee filter with a variety of blue, purple, and turquoise Crayola markers. 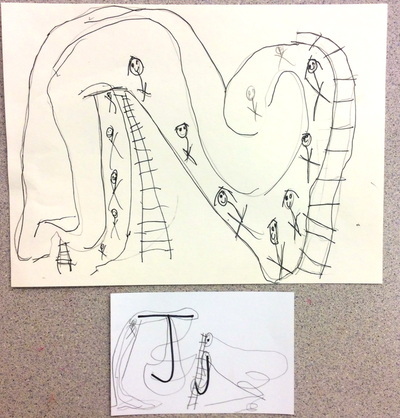 Kindergartners completed a unit on line. 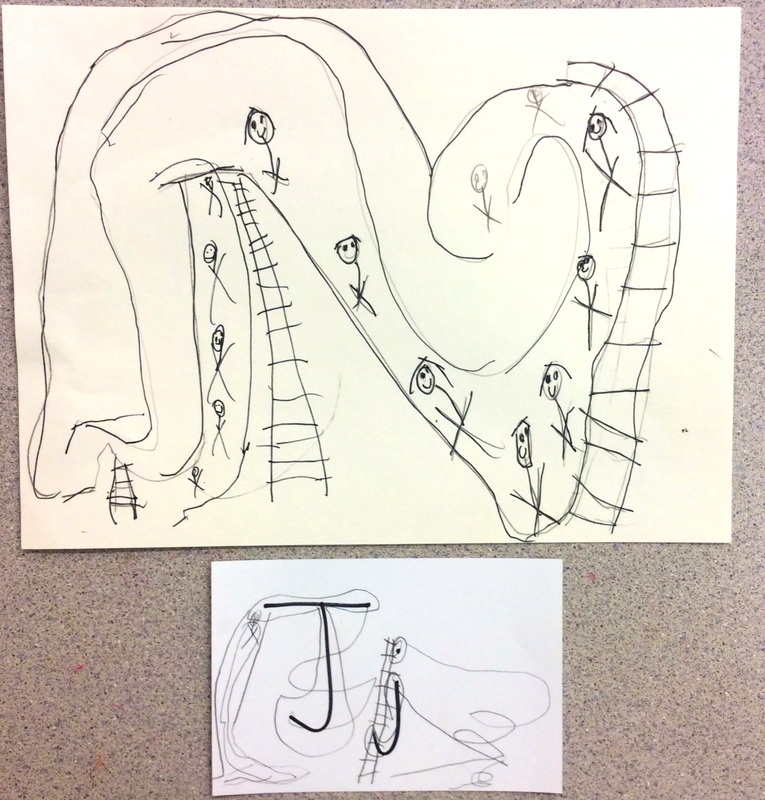 We named all types of lines, pointed them out in and outside of the art room, and practiced drawing them in the air. I gave a little demo on painting before students began, emphasizing correct ways to use “Mr. 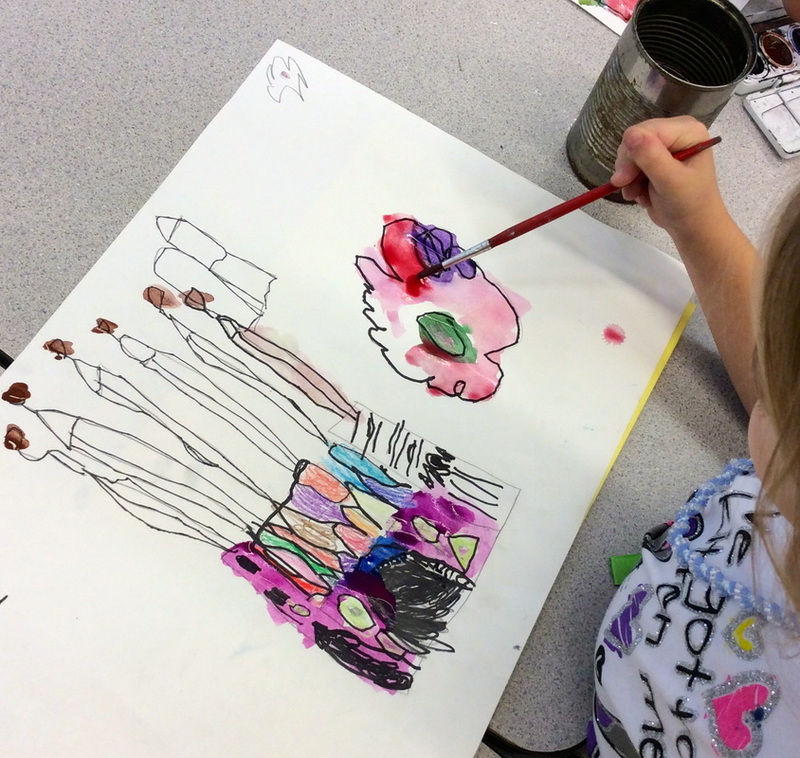 Brush” as well as the not so correct ways. Day 1: Students painted as many different lines as possible on their paper. Day 2: Each class was given a different pair of primary colors: ﻿﻿yellow﻿﻿ & ﻿blue﻿, ﻿blue﻿ & ﻿﻿red﻿﻿, or ﻿red﻿ & ﻿yellow﻿. 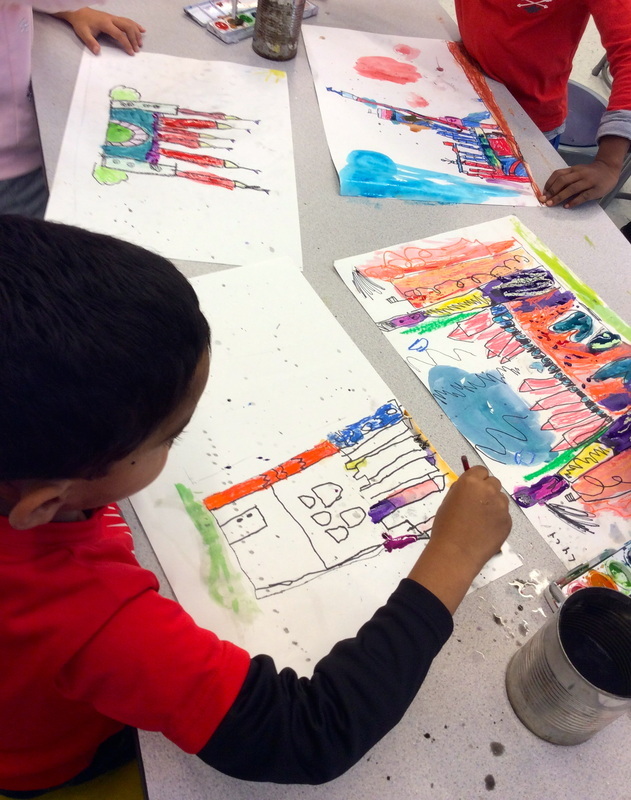 Students experimented with color mixing by creating a variety of colors (secondary and tertiary) out of just two to complete their line painting from the previous class. Prim﻿ary Colors: cannot be mixed from any other colors. 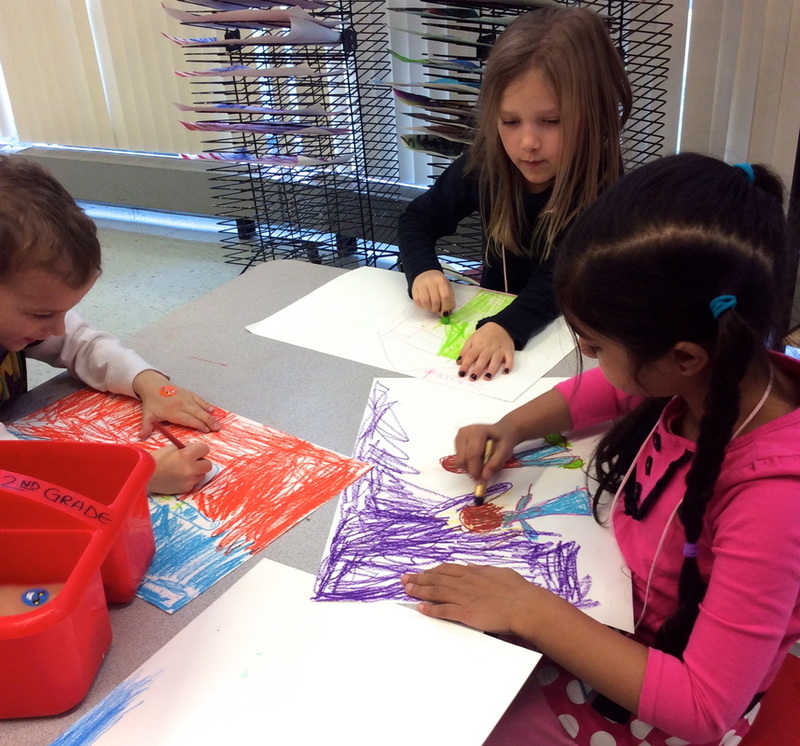 S﻿e﻿﻿c﻿on﻿﻿d﻿﻿ary ﻿C﻿olors: mixing two equal amounts of two Primary Colors. 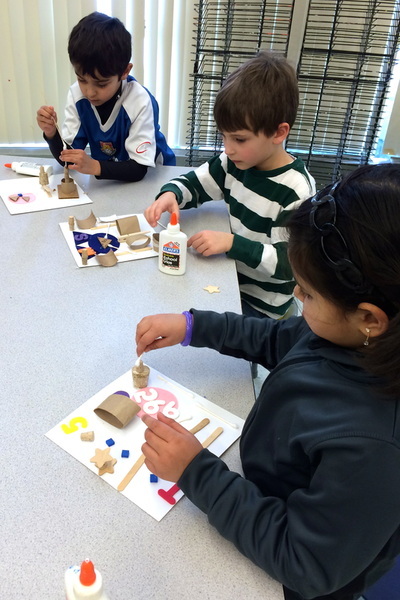 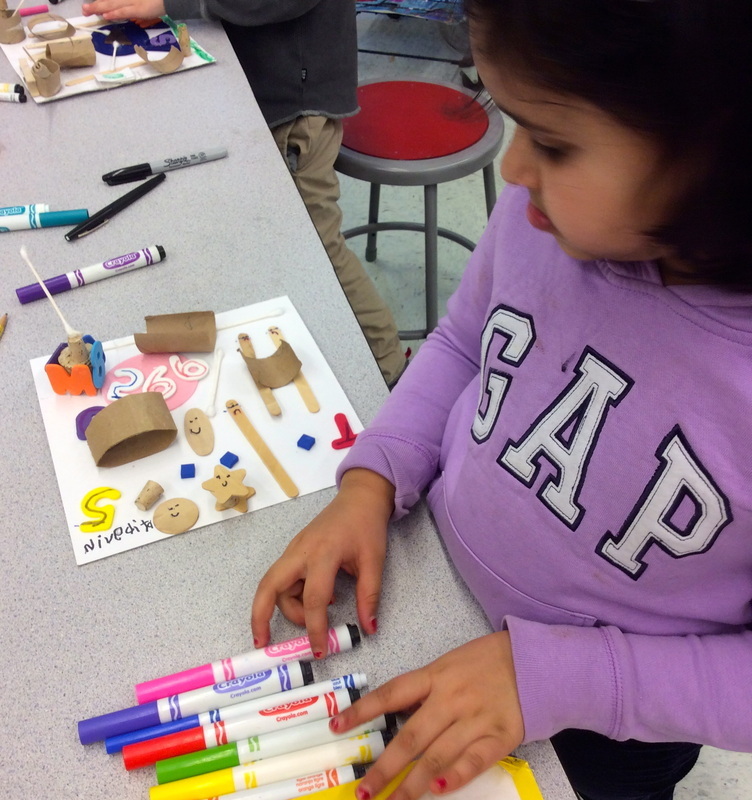 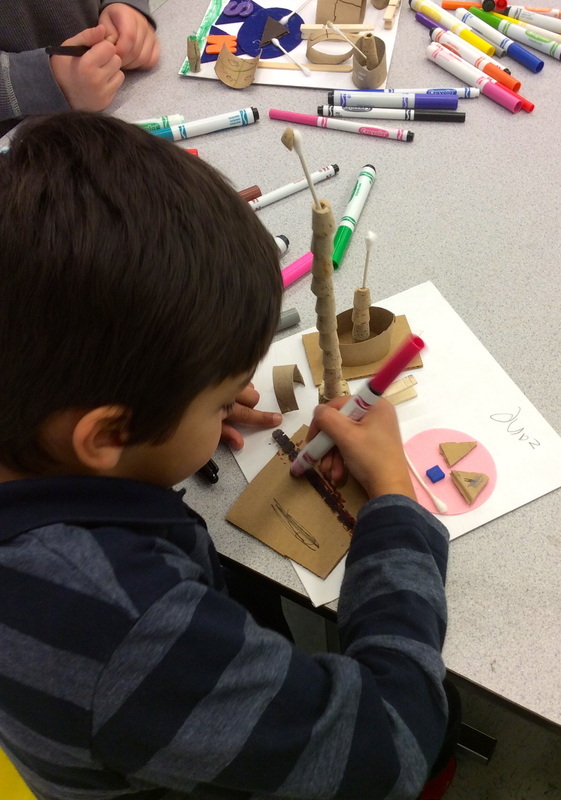 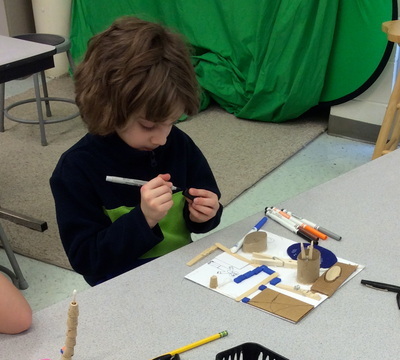 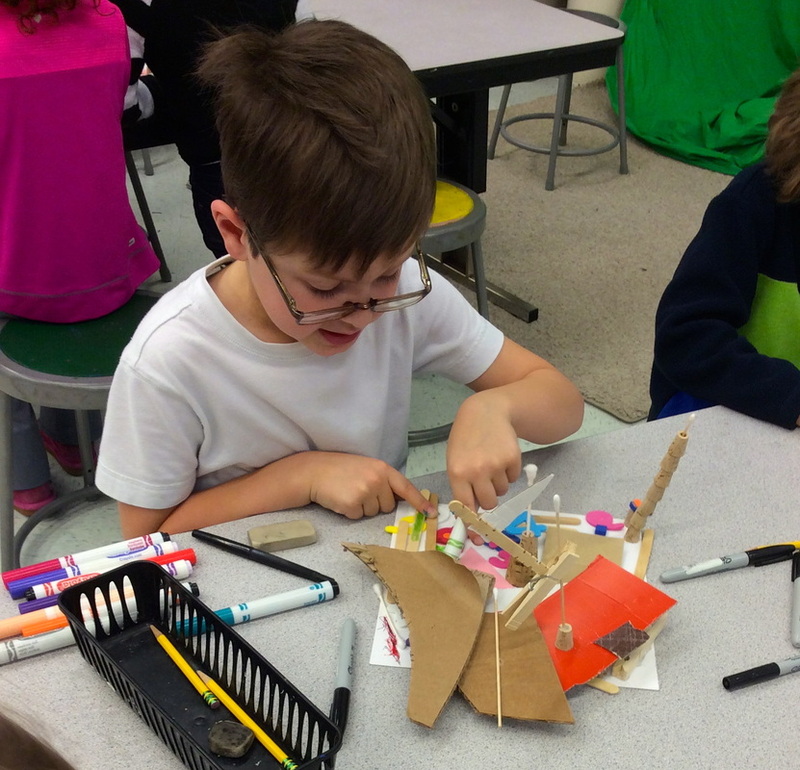 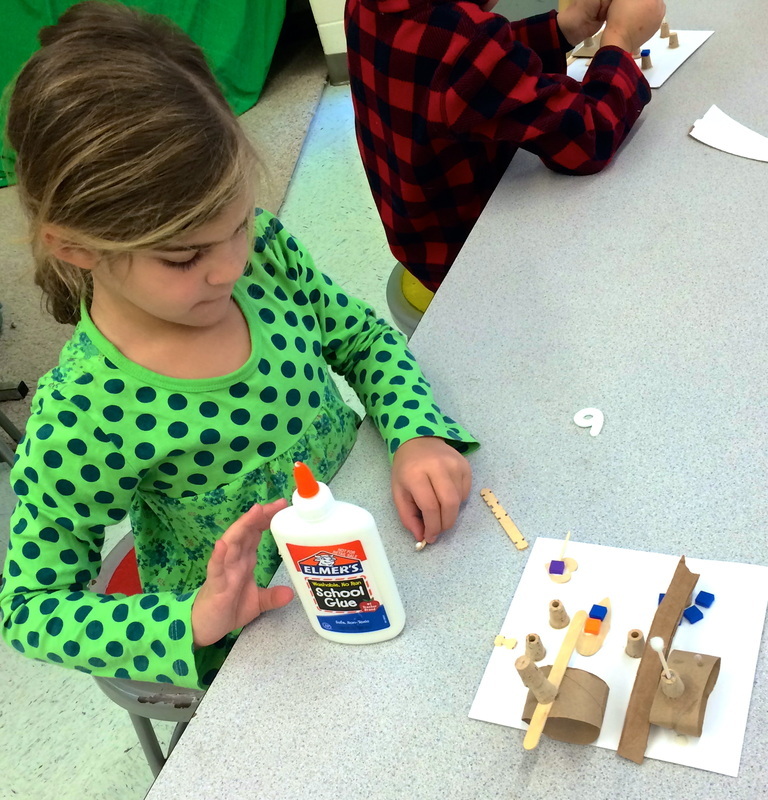 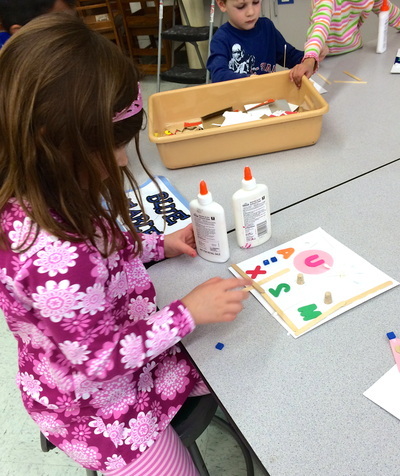 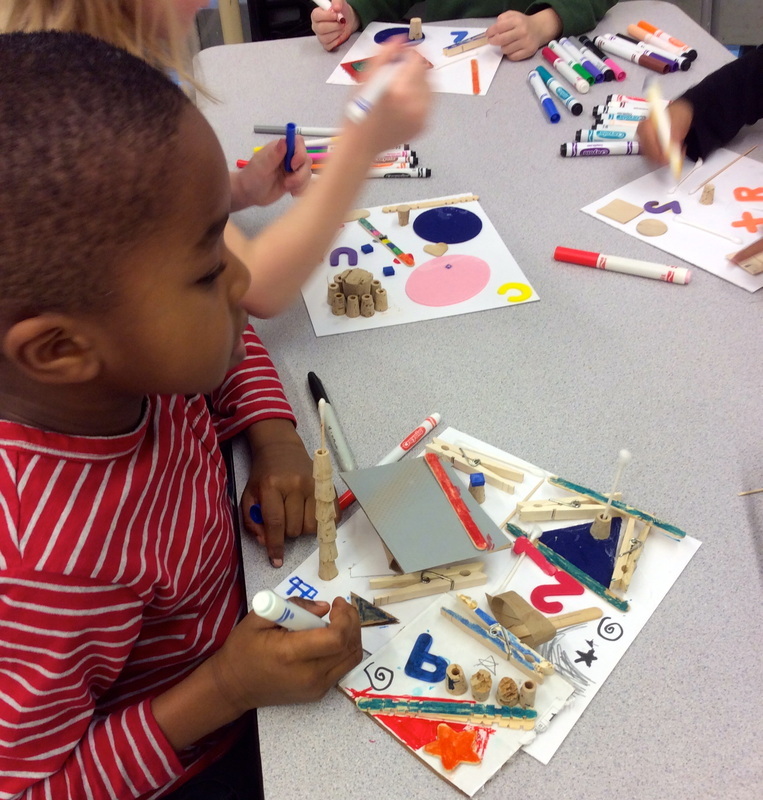 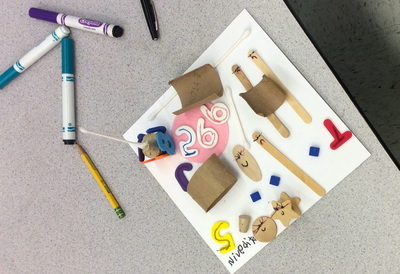 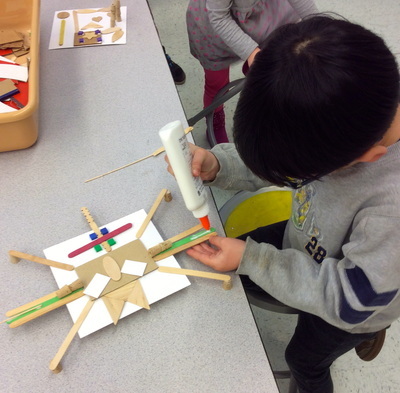 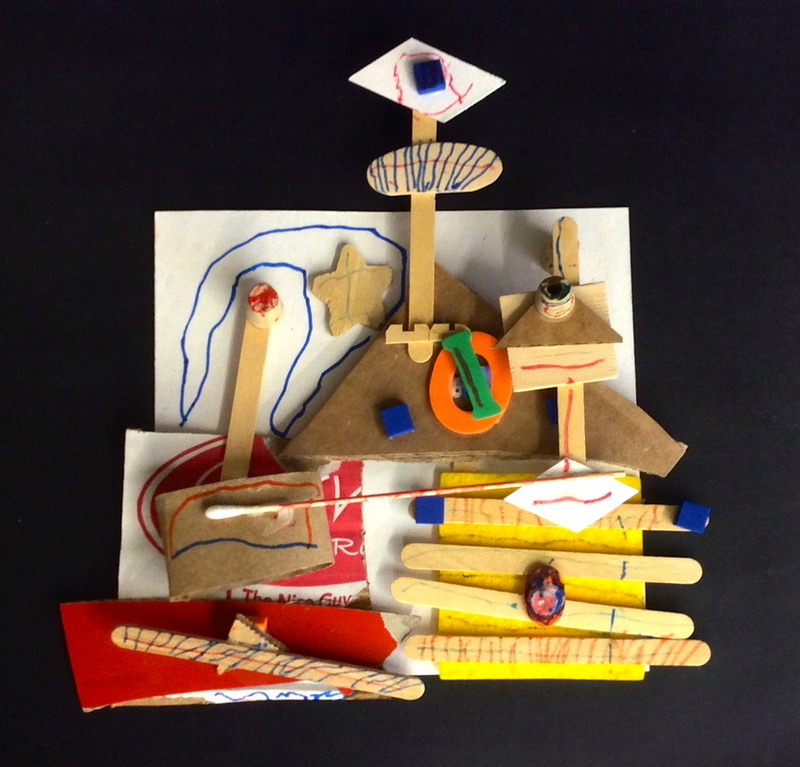 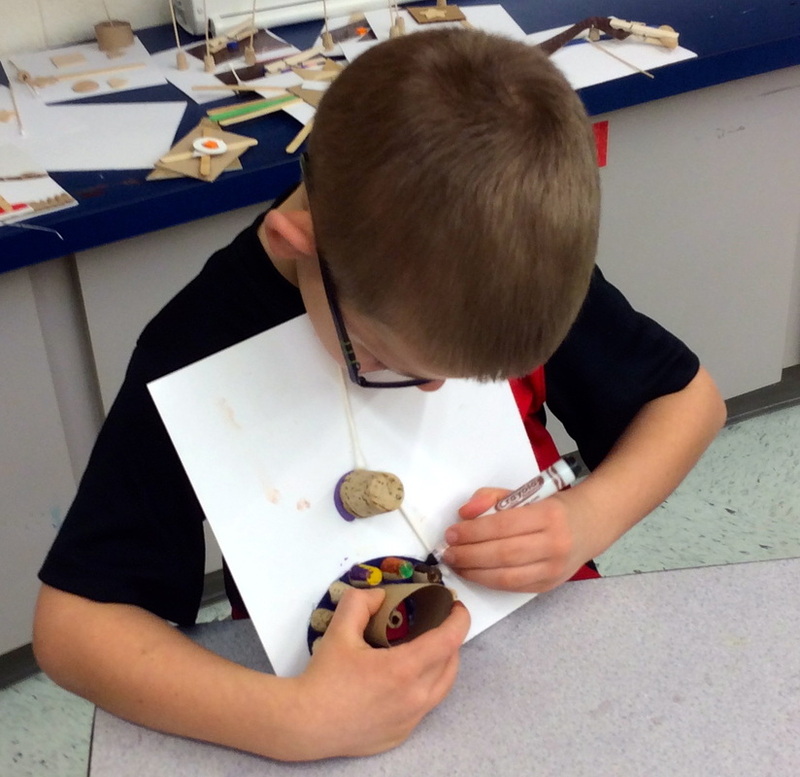 Kindergartners were to create a found object sculpture using recycled materials from the art room. 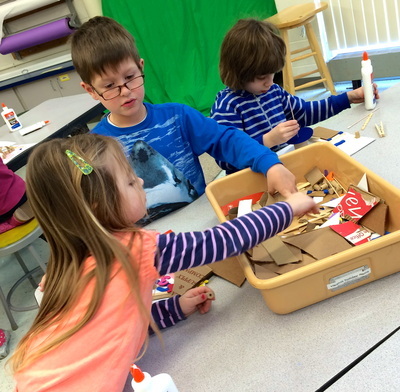 (popsicle sticks, foam squares, wood scraps, Q-tips, etc.) 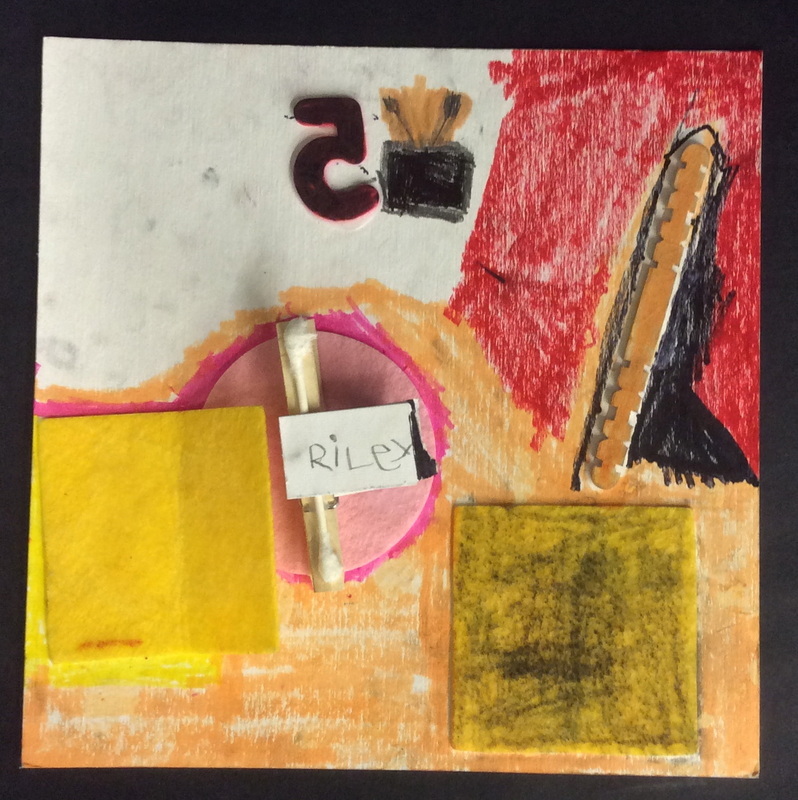 We looked at artist Louise Nevelson’s work, which was known for being monumentally large, full of texture, rhythm, and found objects, and was always painted a solid color. 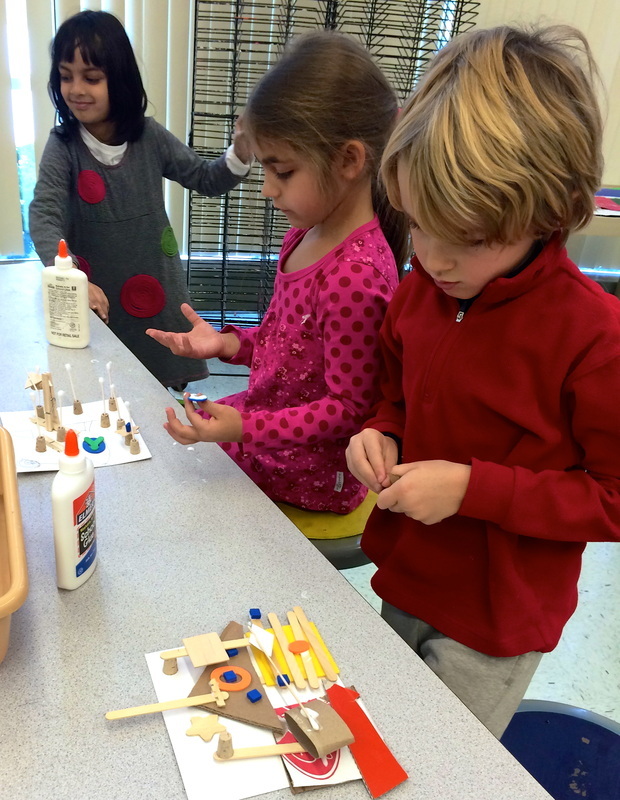 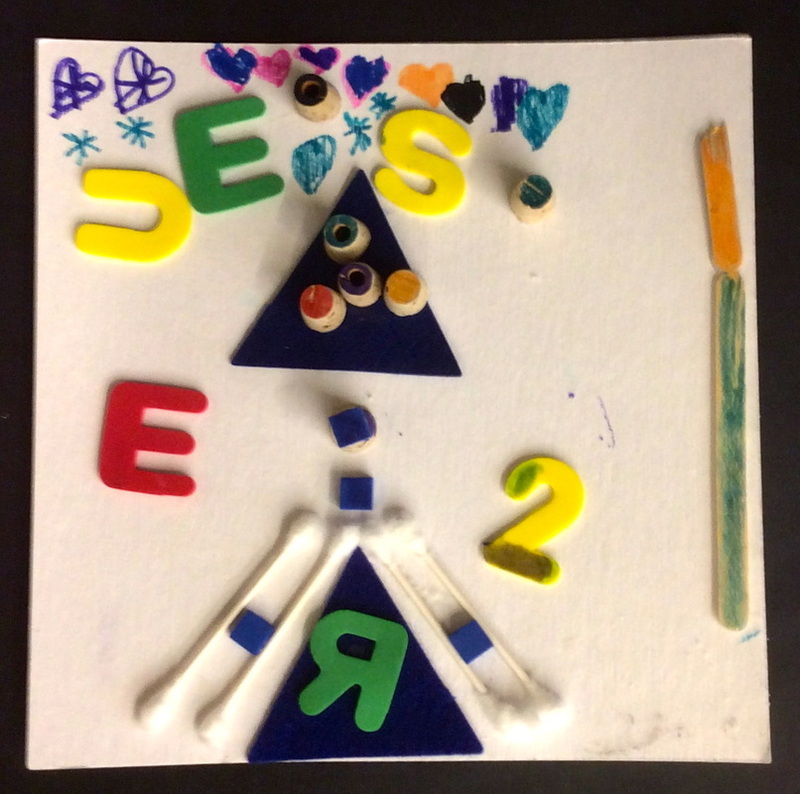 Students were to use a variety of objects and build their sculptures up by stacking, creating dimension. 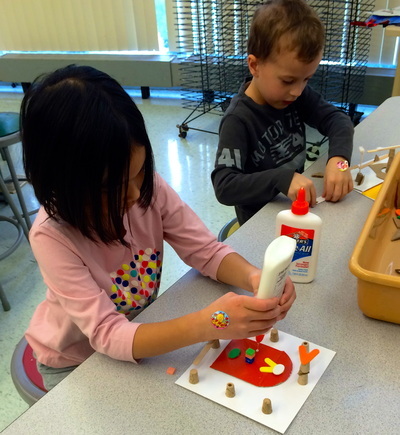 We arranged and rearranged our sculptures until we found the most interesting composition before gluing objects in place. 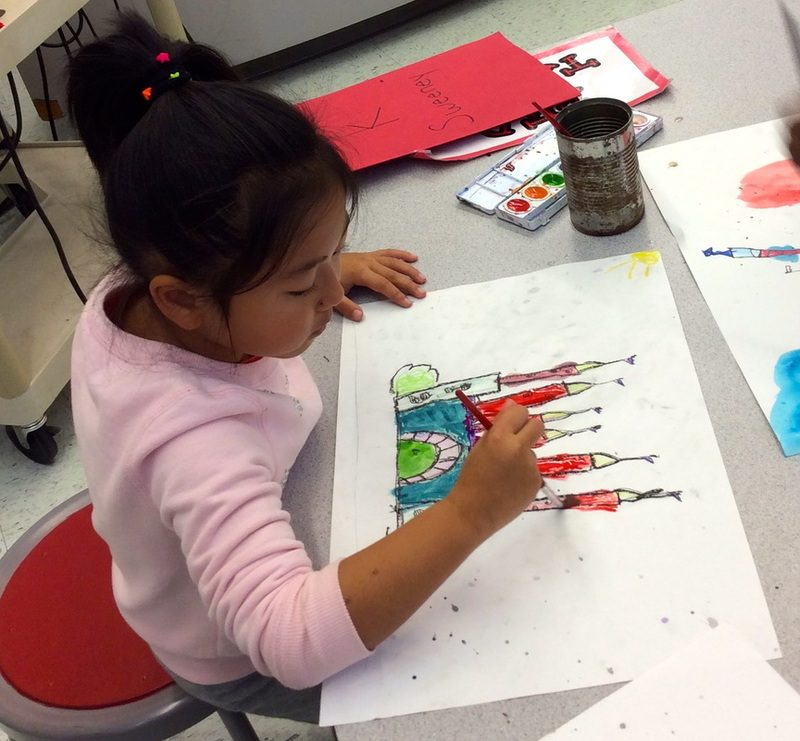 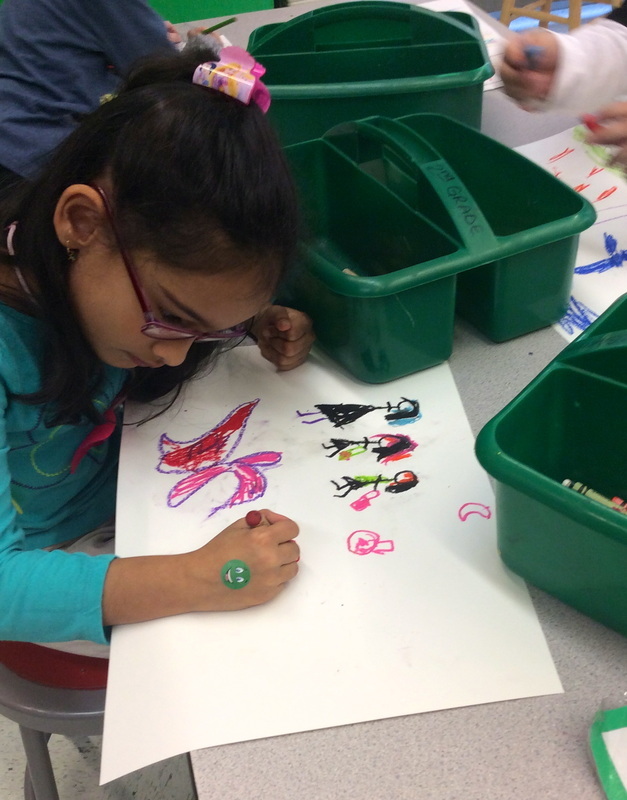 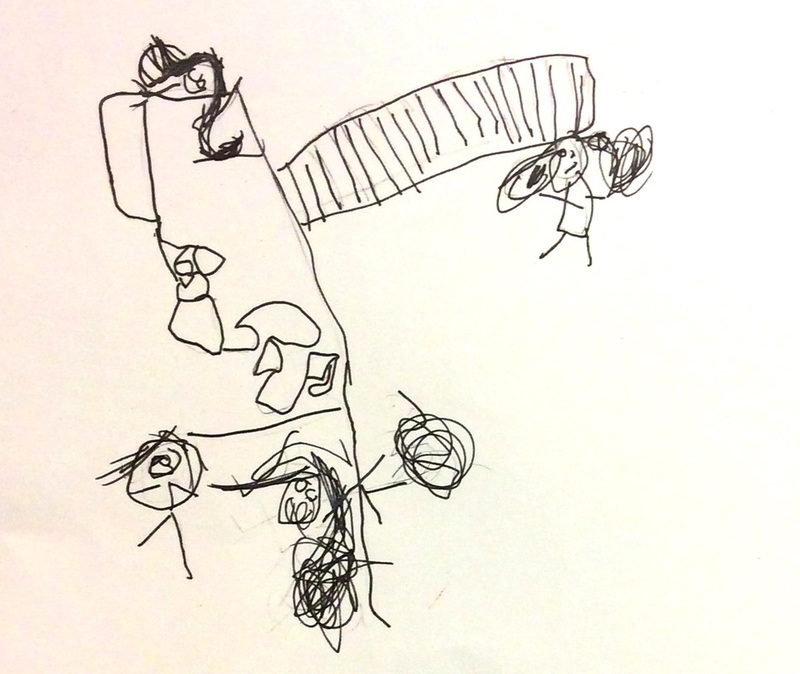 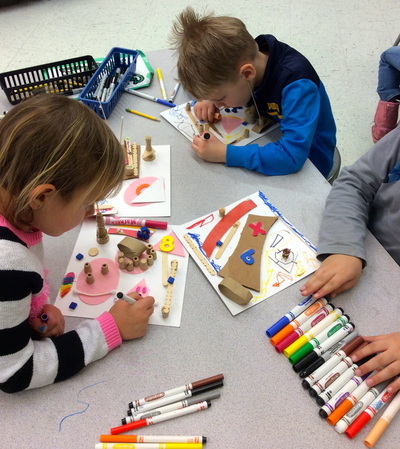 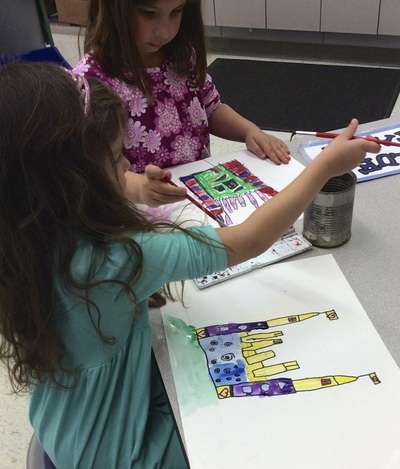 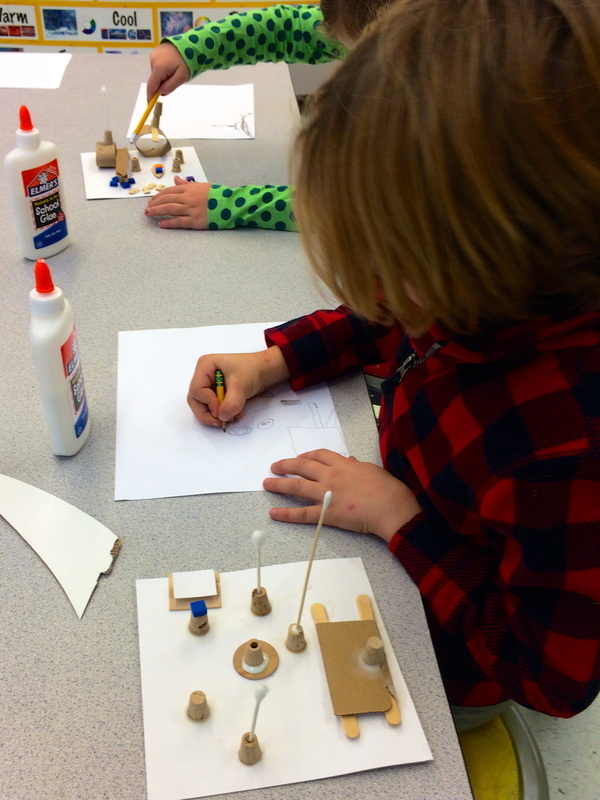 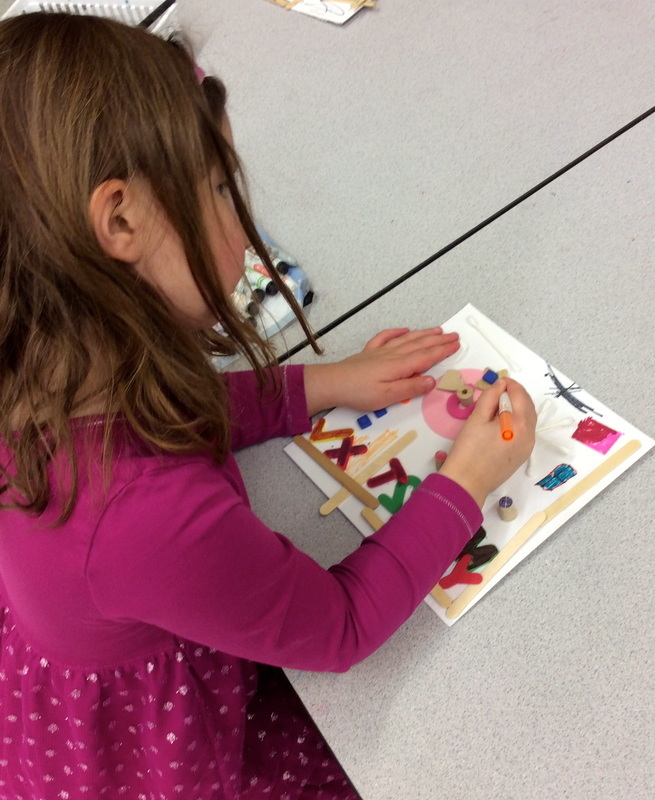 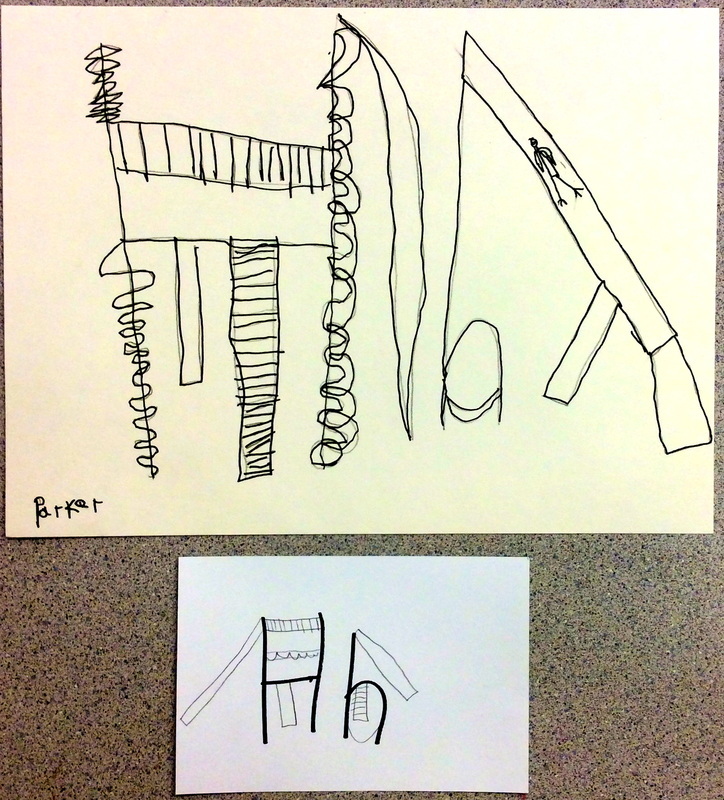 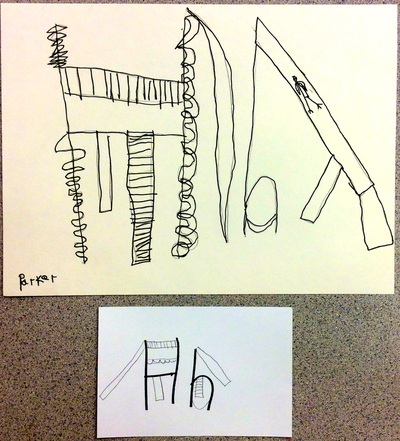 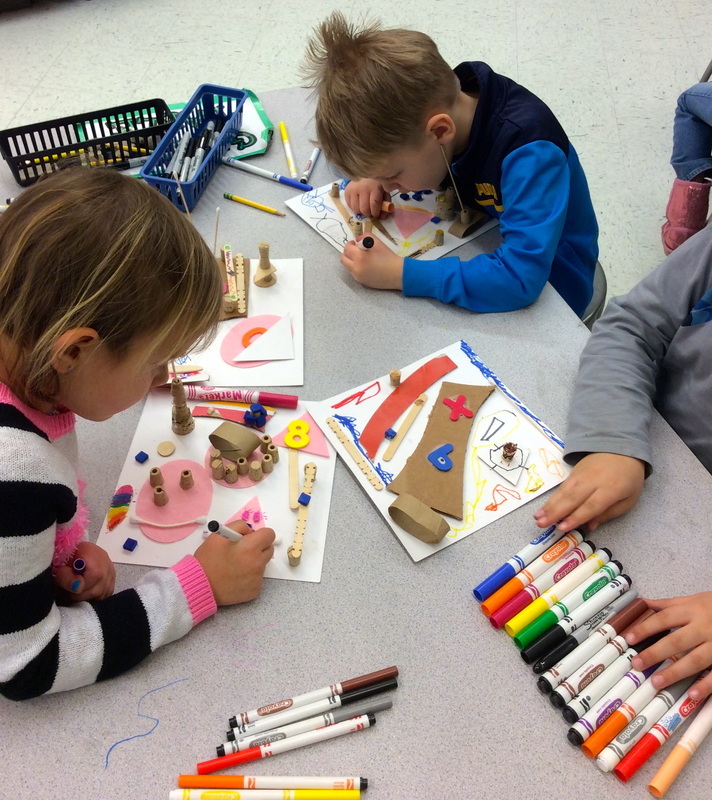 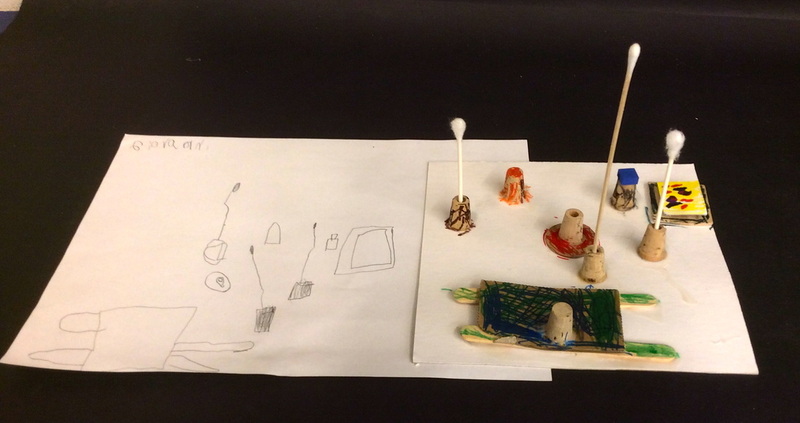 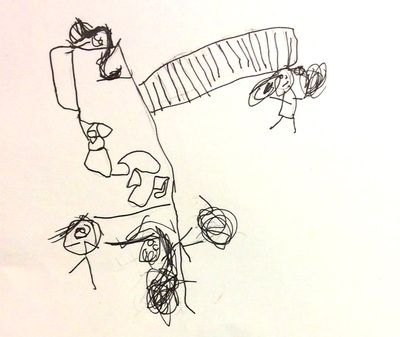 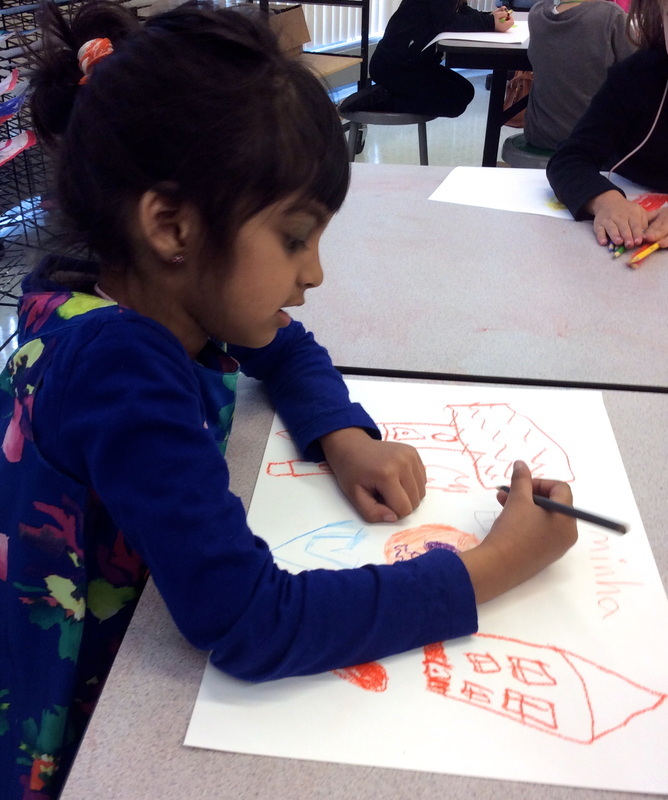 Then, the kindergartners practiced their observational drawing skills by drawing their sculptures. 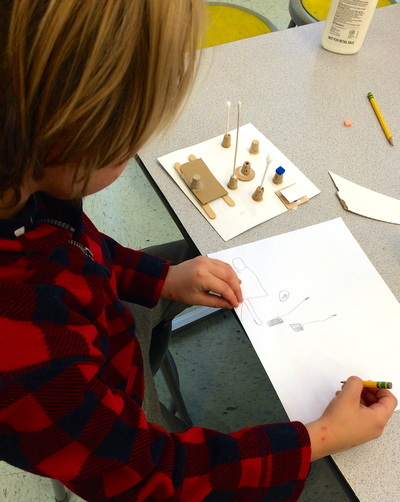 This process is oh so important and great for teaching shapes, lines, observational drawing and architecture. 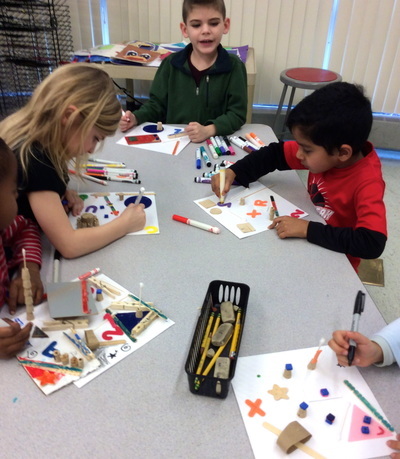 We were very busy in weeks leading up to winter break. 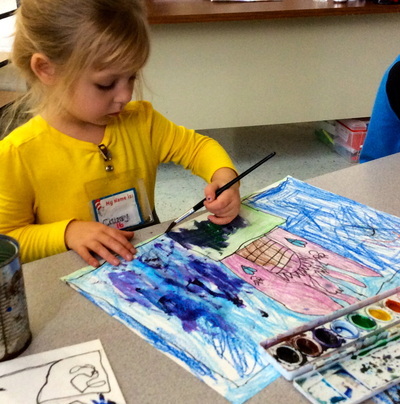 So busy that I didn't get a chance to take hardly any pictures. 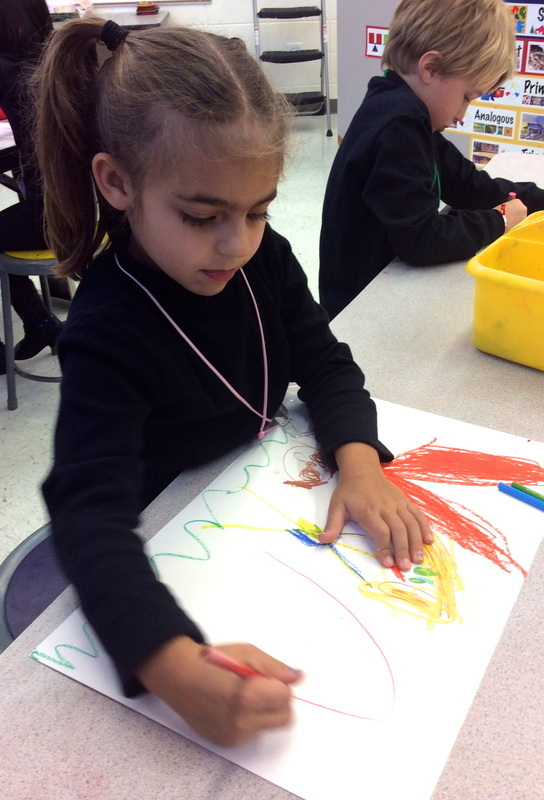 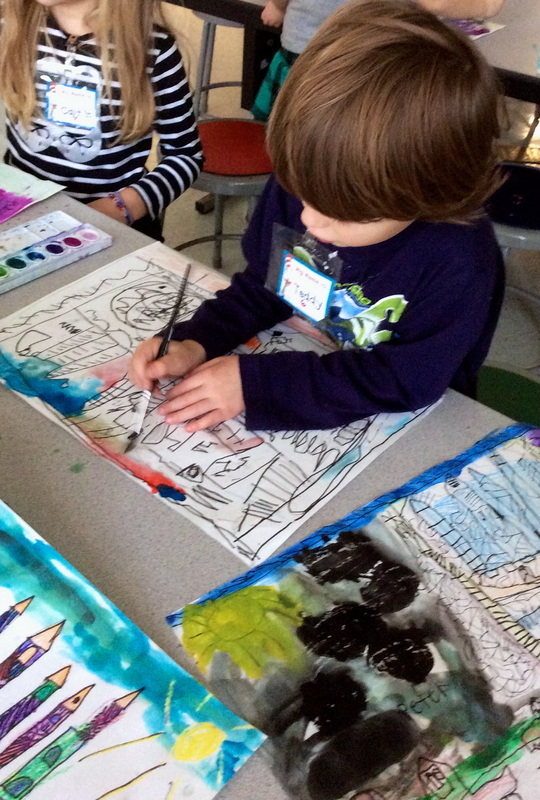 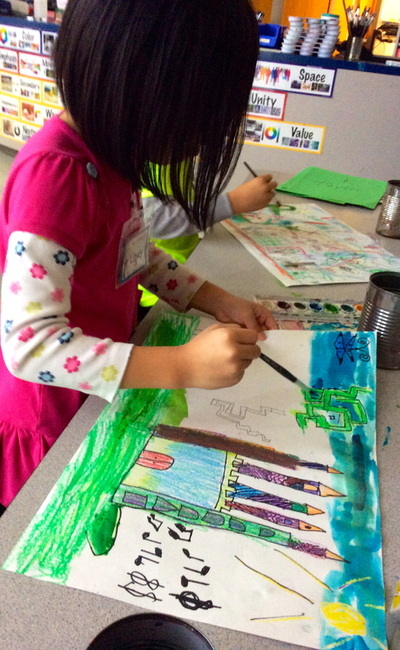 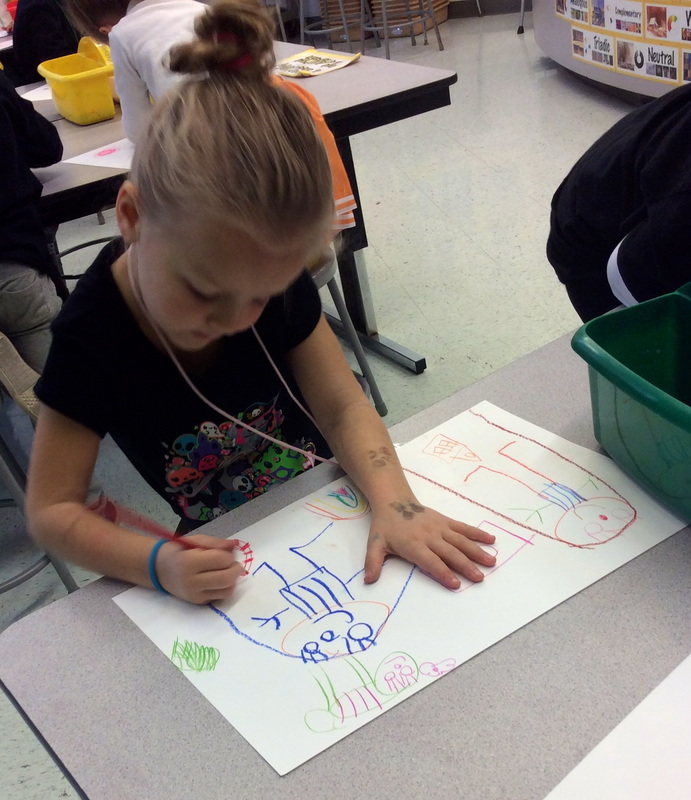 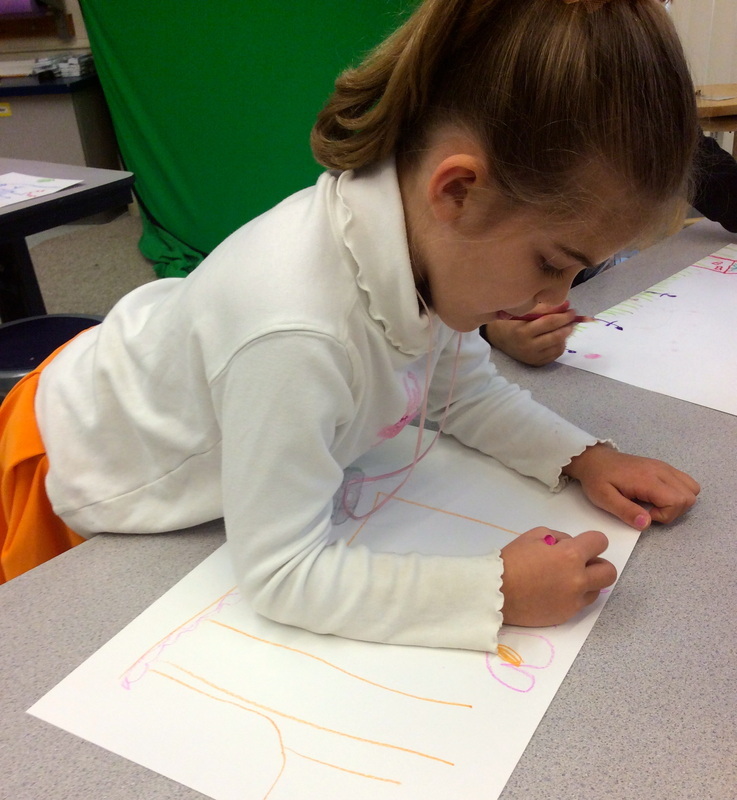 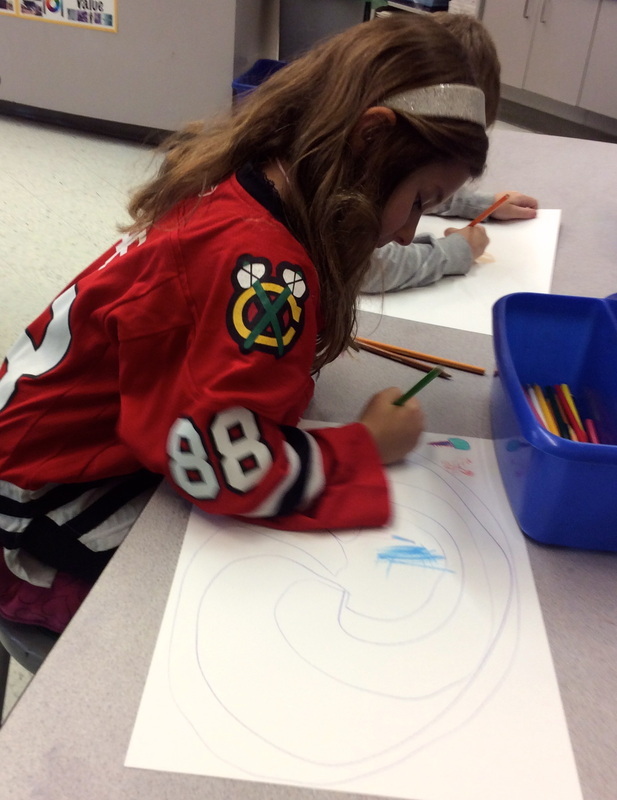 Kindergartners are learning to identify and apply different types of line in their artwork. 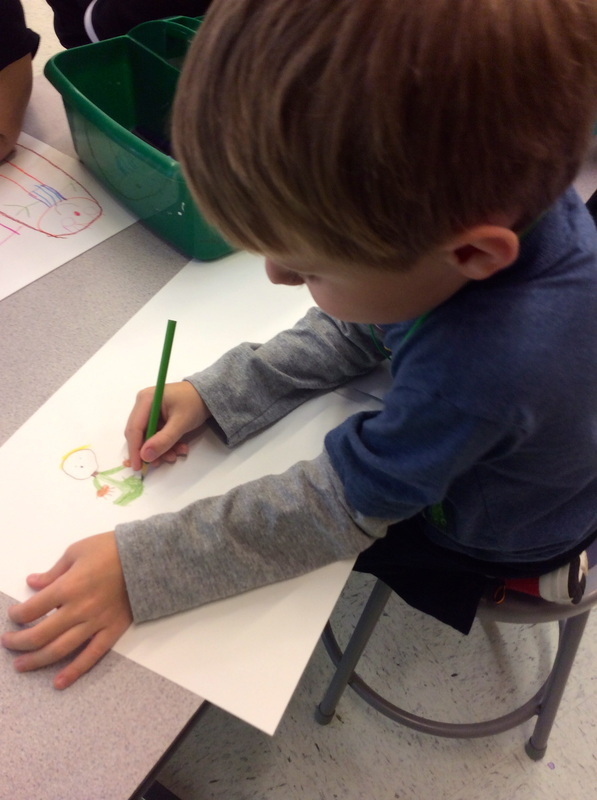 Each student was given a notecard with his or her letter written on it. 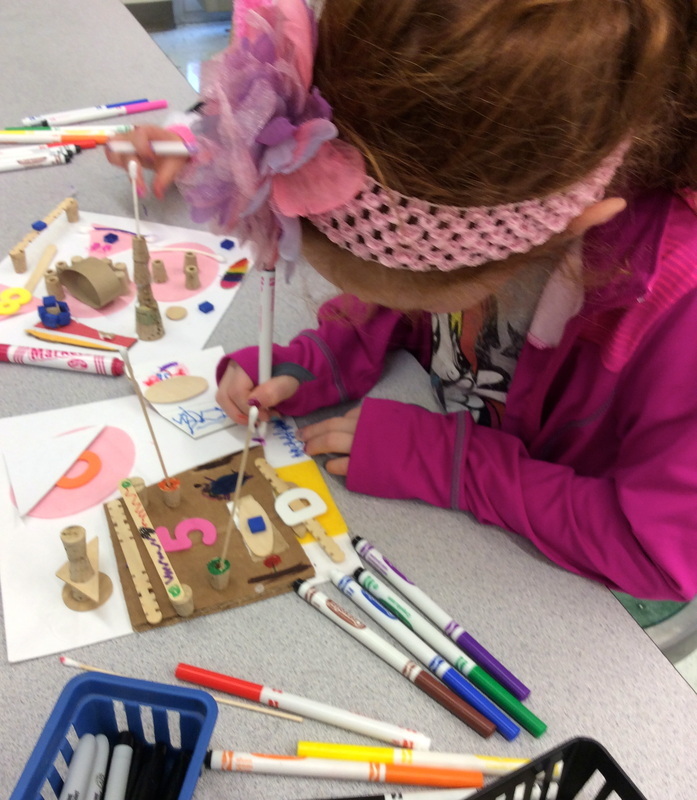 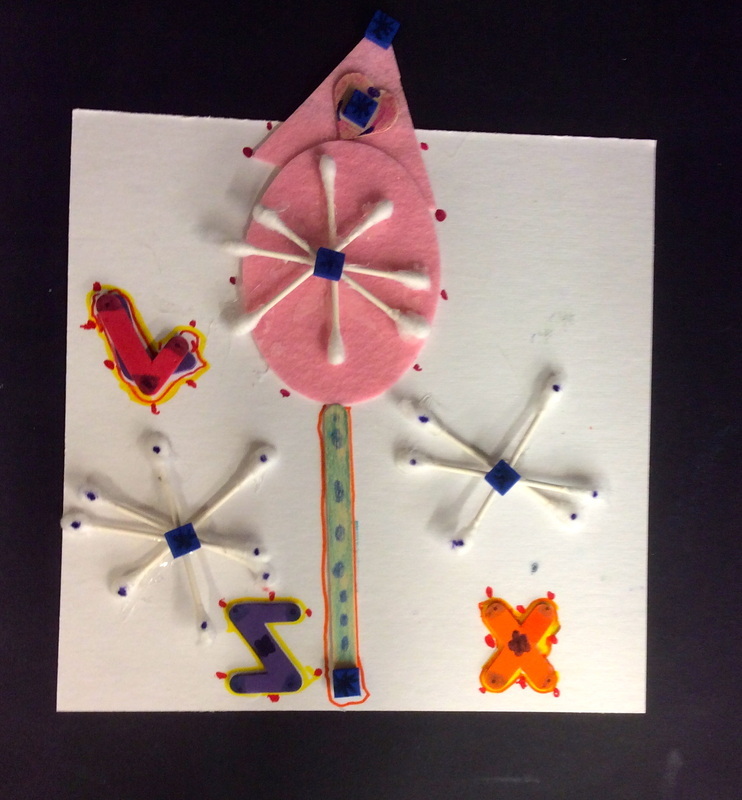 Using the character received, the kinders used their imagination and creativity to transform the symbol into interesting, exciting playground structures. 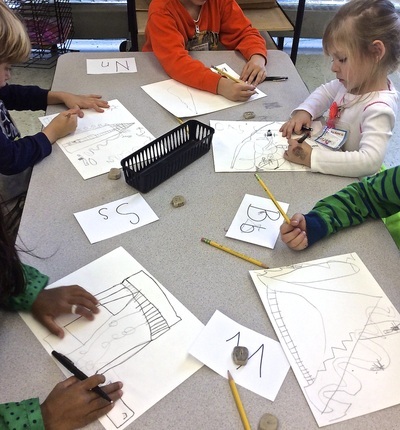 After using different types of line to sketch a playground onto the letter structure, students were able to begin tracing pencil lines with felt tip pen. Can you guess what each letter is? 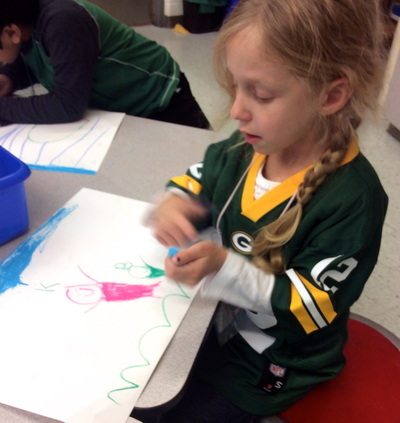 Half Day Kindergarten had their first art class of the year on Halloween! 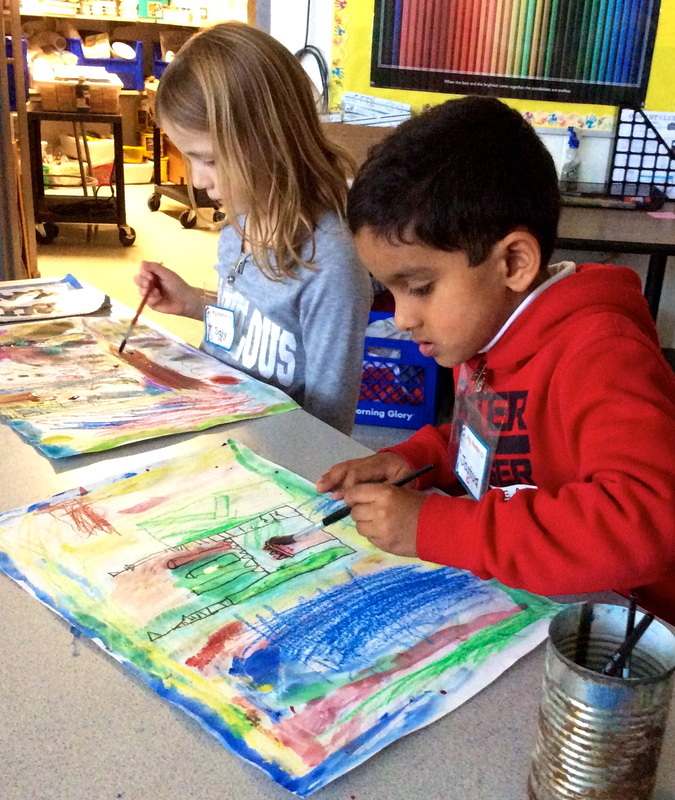 I wanted the kindergartners to have as much opportunity to experience art as possible for their first art class of the year. 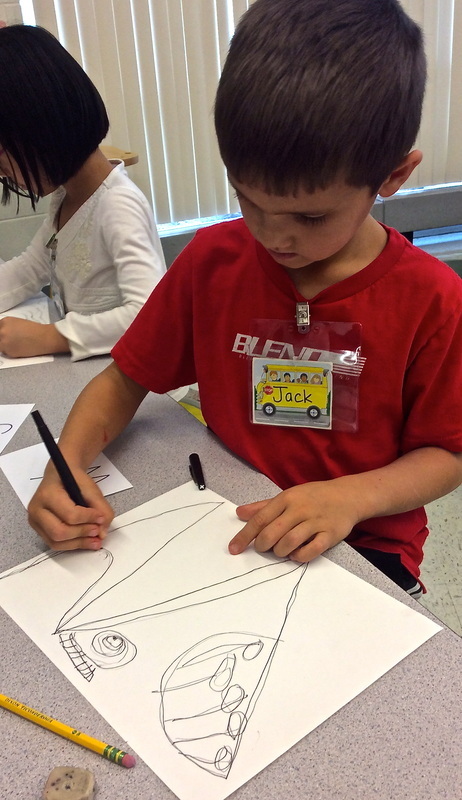 So, on this crazy, fun-filled first day, these kinders wasted no time at all. They jumped right in, excited to make art! 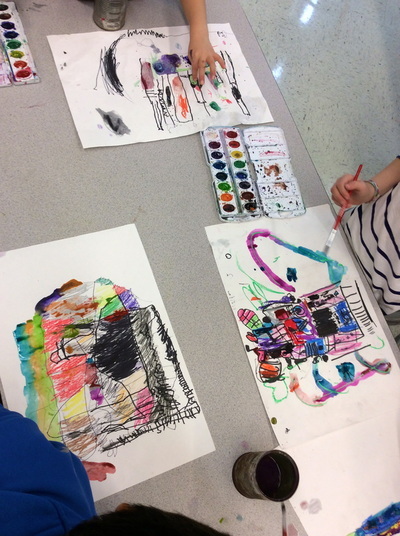 Each table had three materials to choose from: oil pastels, crayons, and colored pencils. 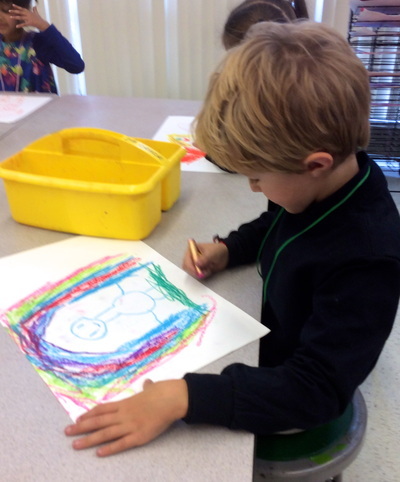 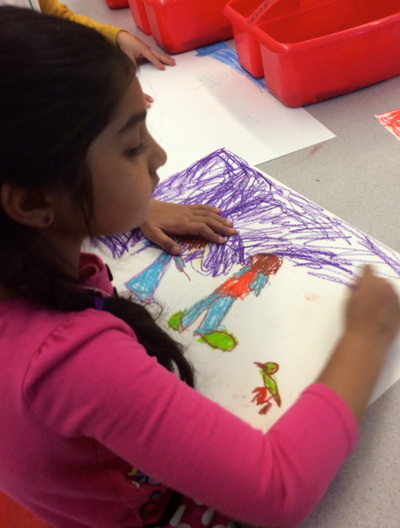 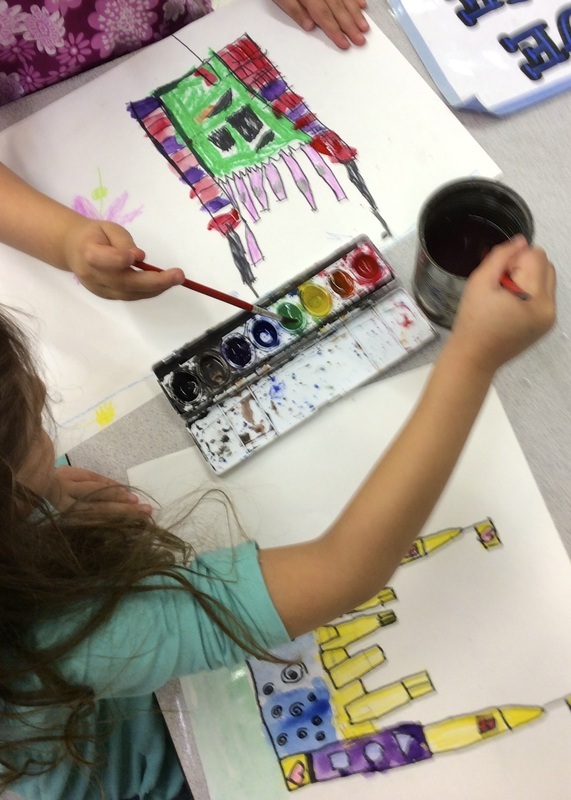 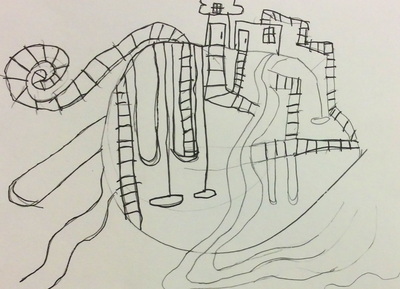 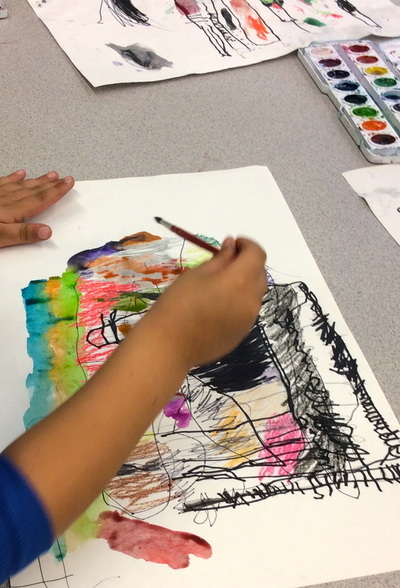 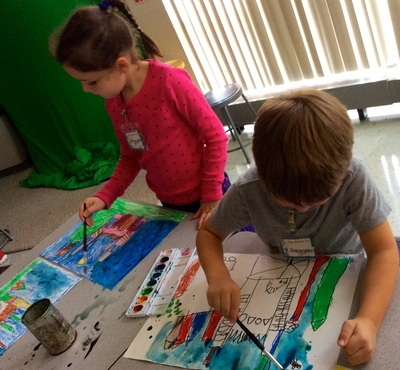 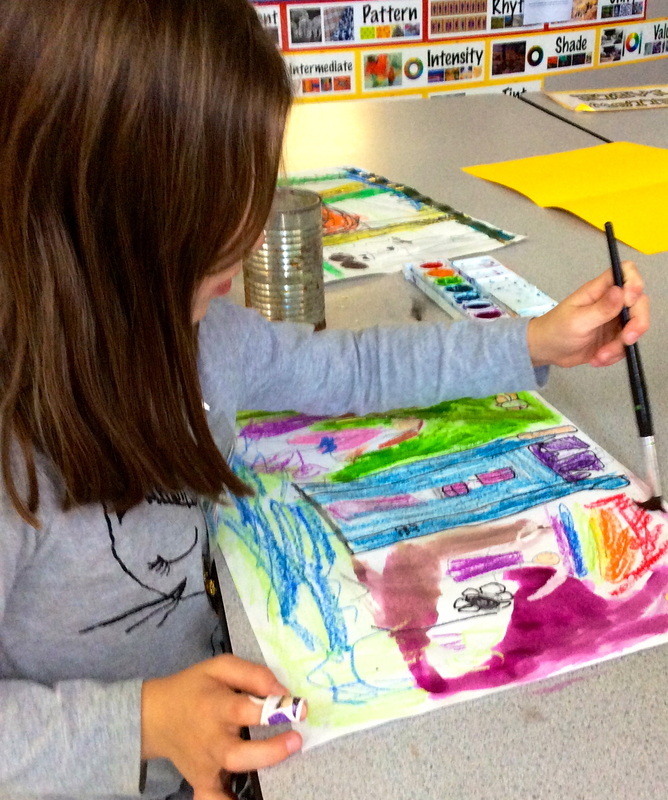 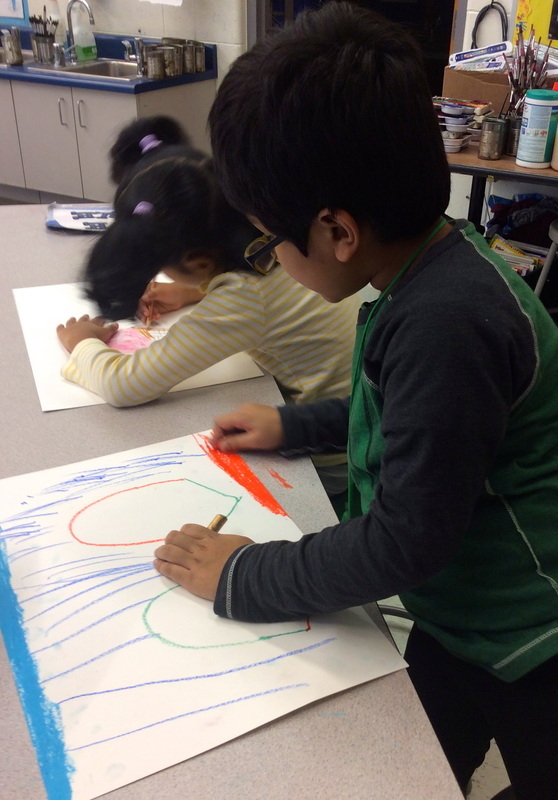 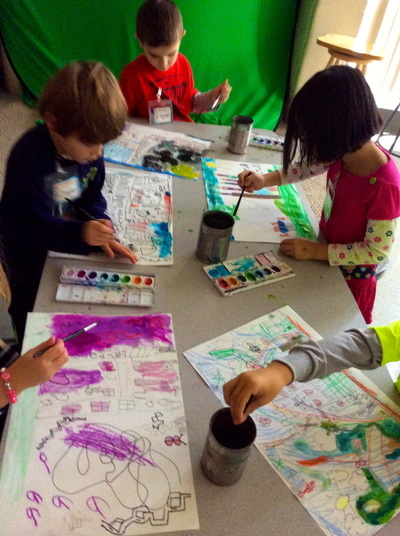 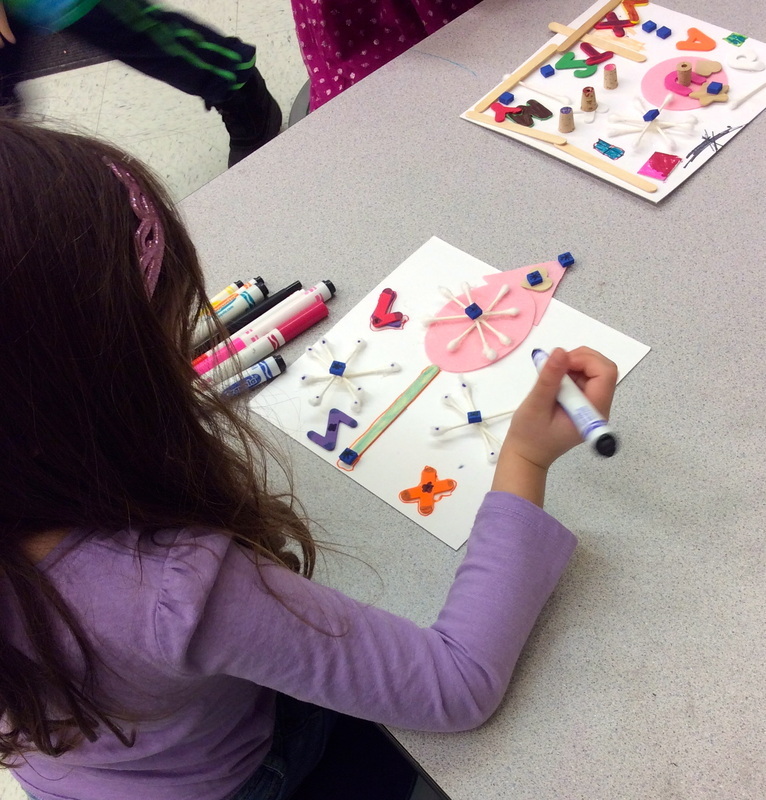 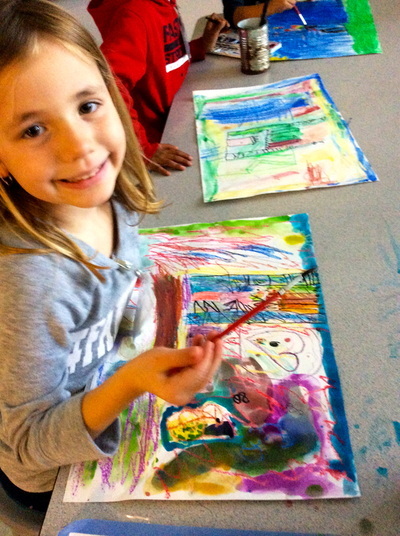 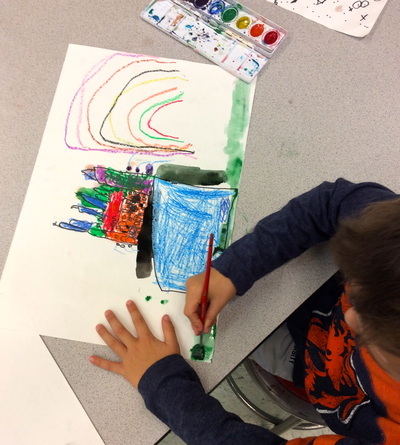 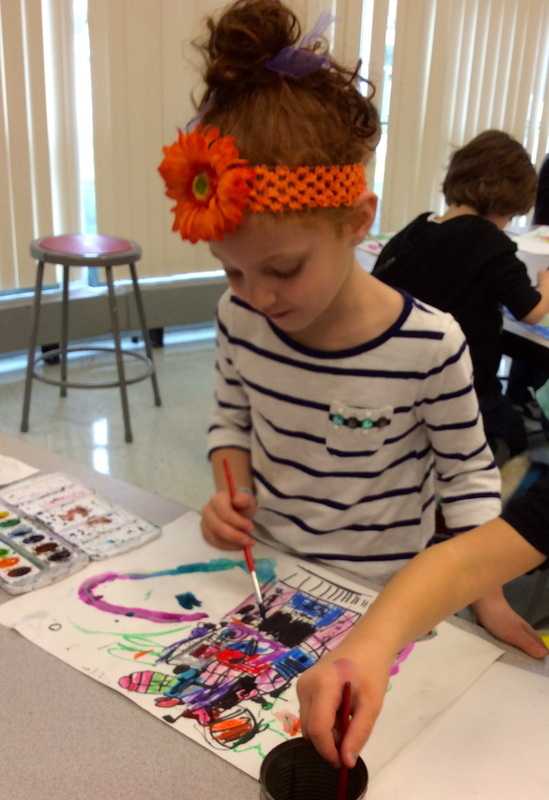 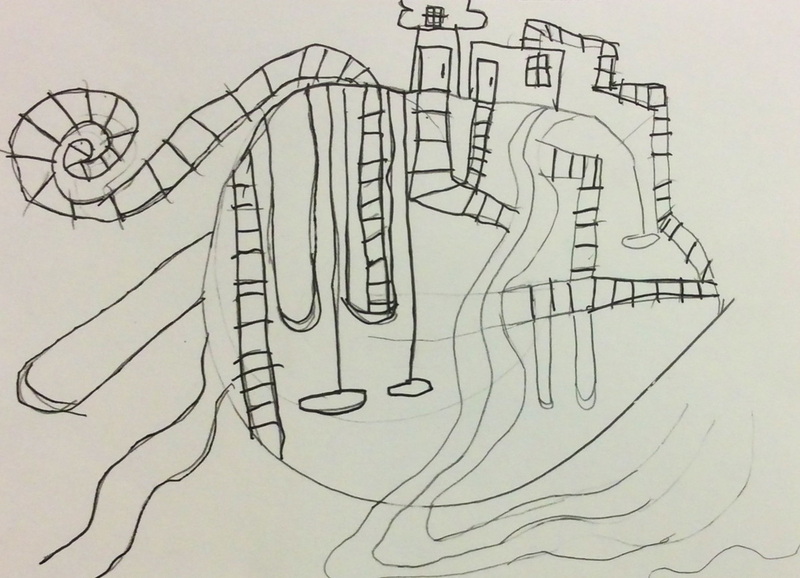 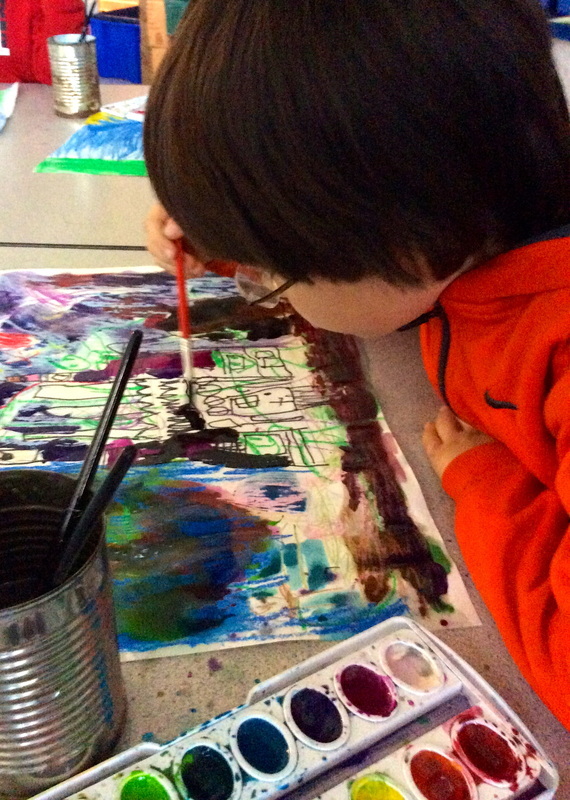 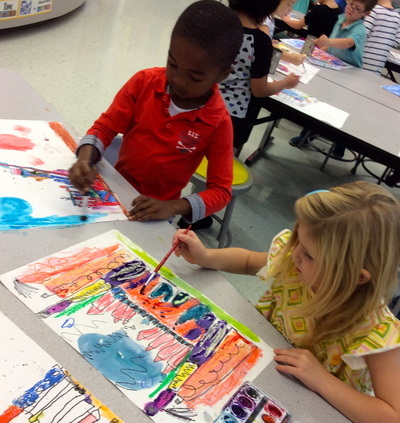 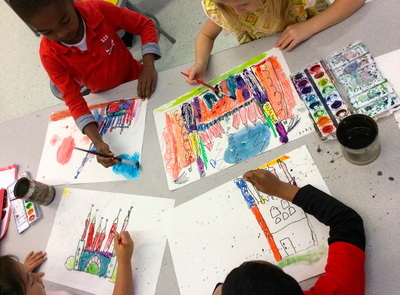 Kindergartners visualized themselves doing whatever it is they absolutely love and created art about it. 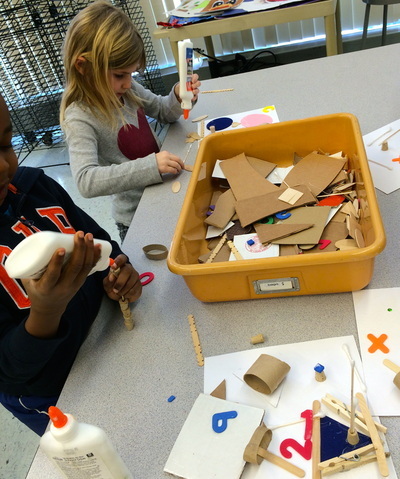 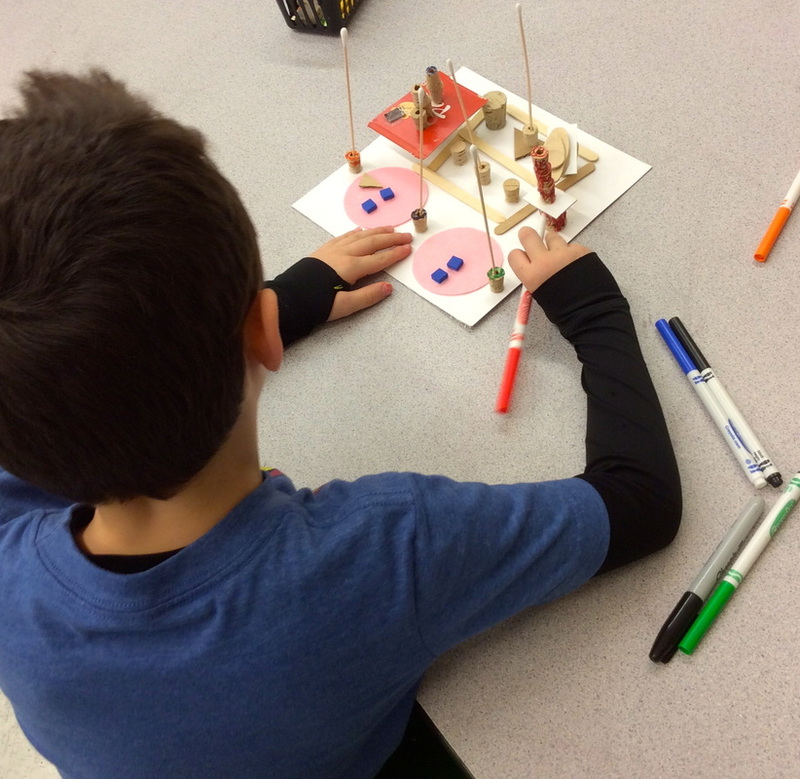 They were encouraged to experiment with the materials, use their imagination, and, most of all, HAVE FUN.